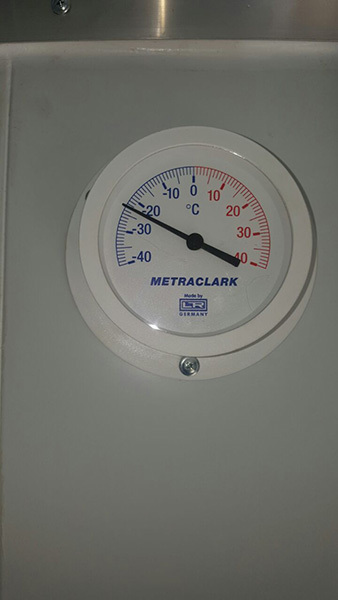 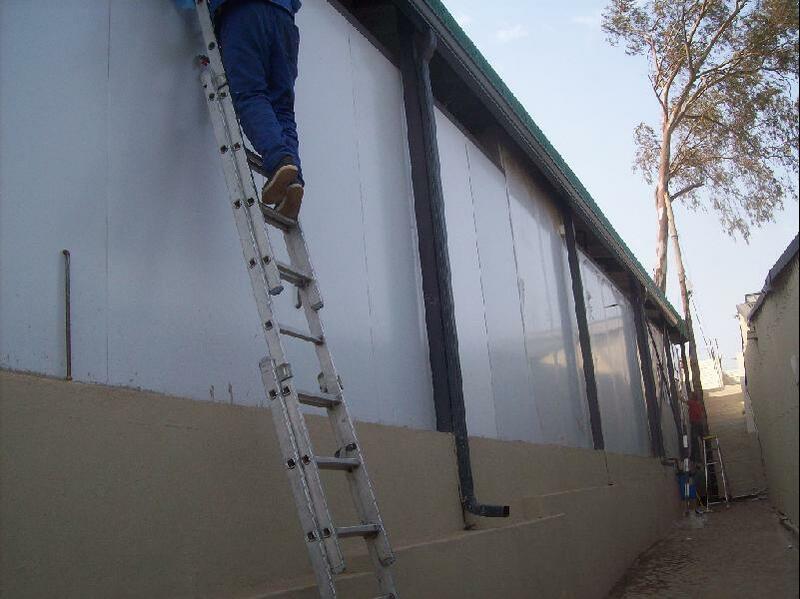 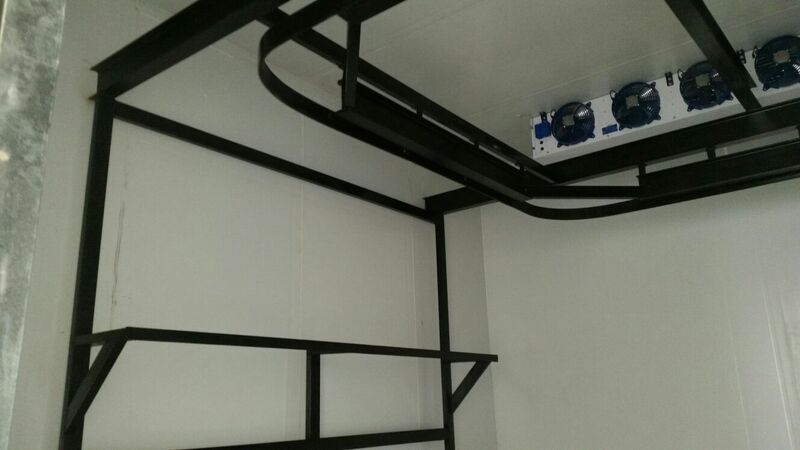 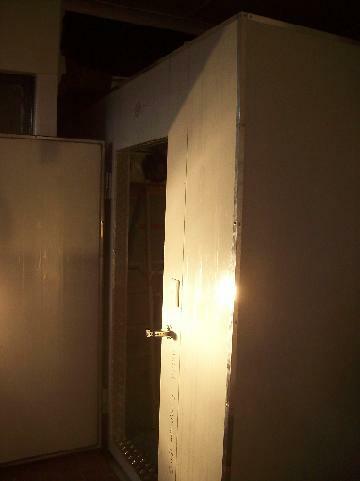 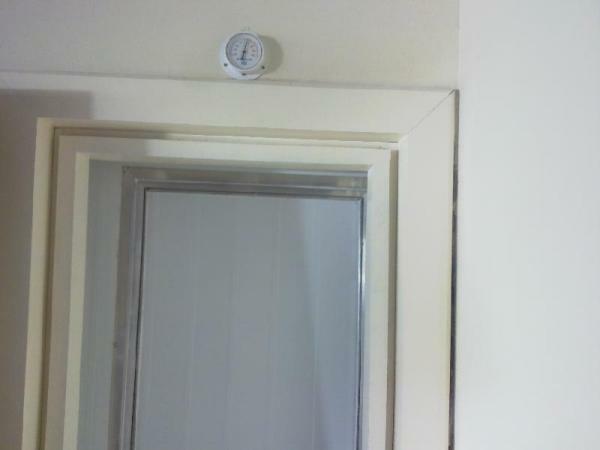 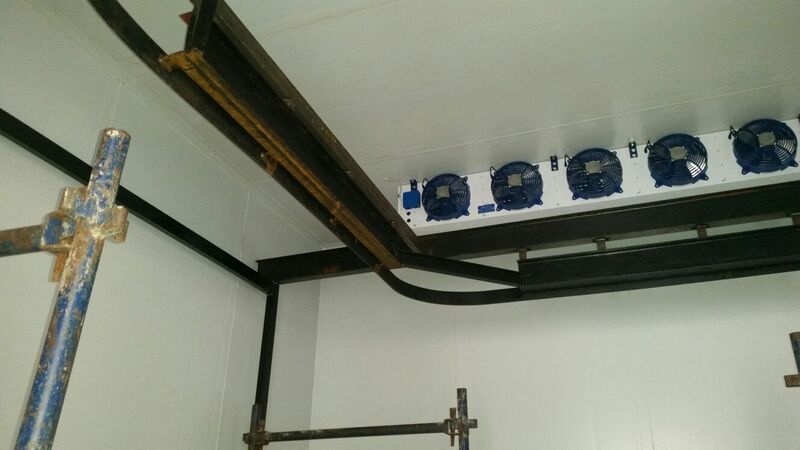 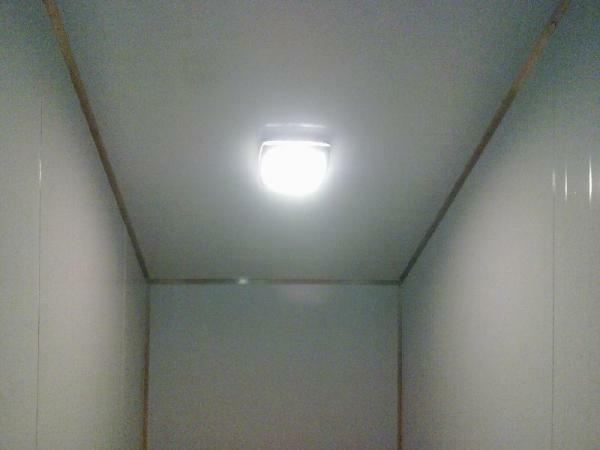 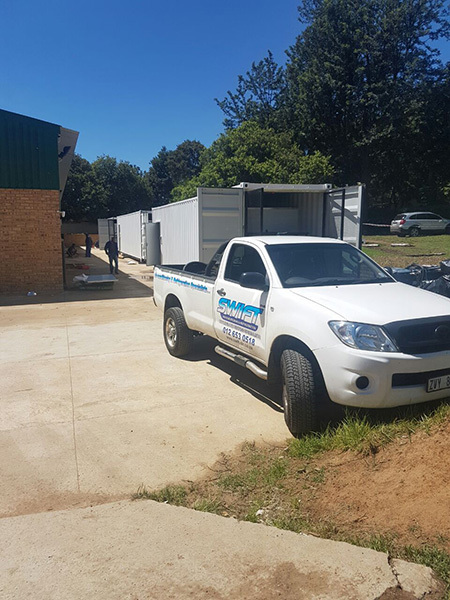 2 x Cold Rooms installed at a house in Waterkloof. 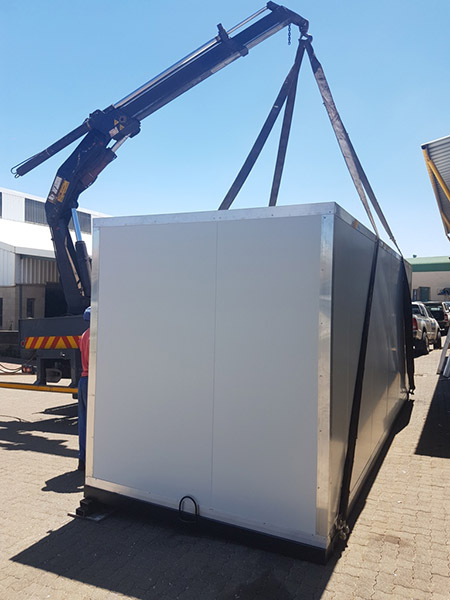 The client ordering these two cold rooms, had a need for domestic use of the one cold room, storing cold drinks and perishable foods, while using the second cold room entirely for storing his very expensive wines. 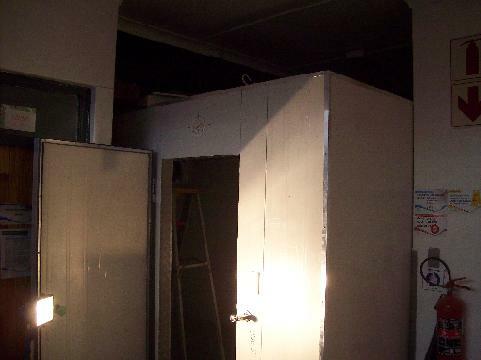 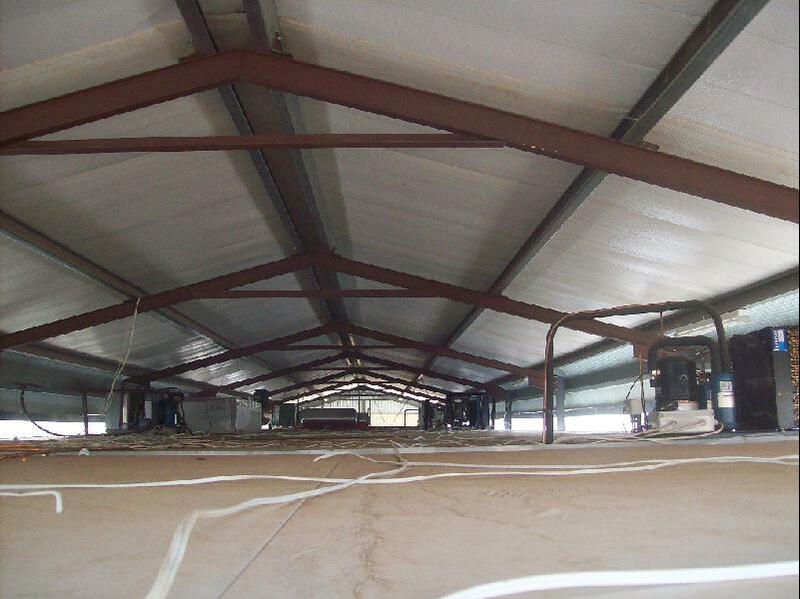 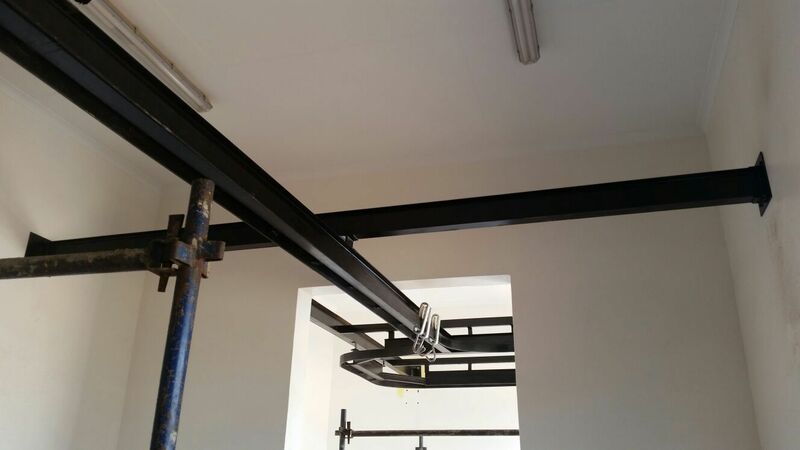 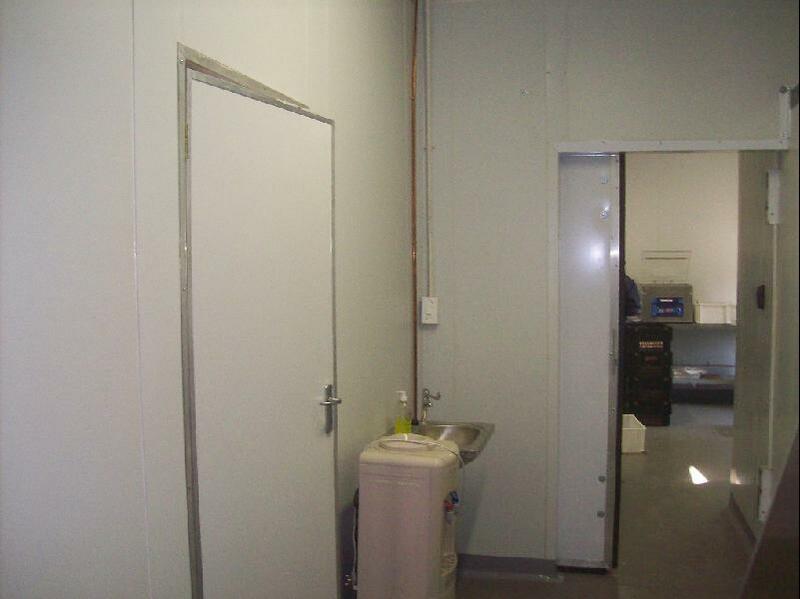 Both cold rooms were erected in one week and was up and running by the time the client returned from his over seas trip. 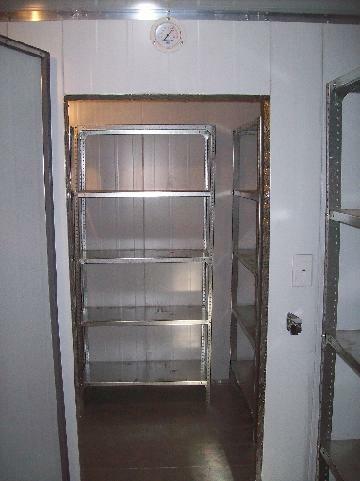 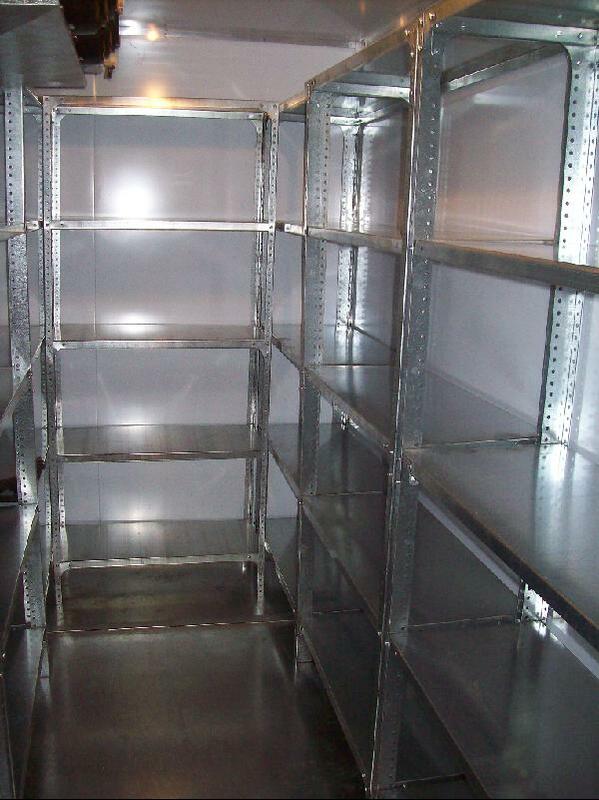 Needless to say that the client was very impressed with his new cold room storage space. 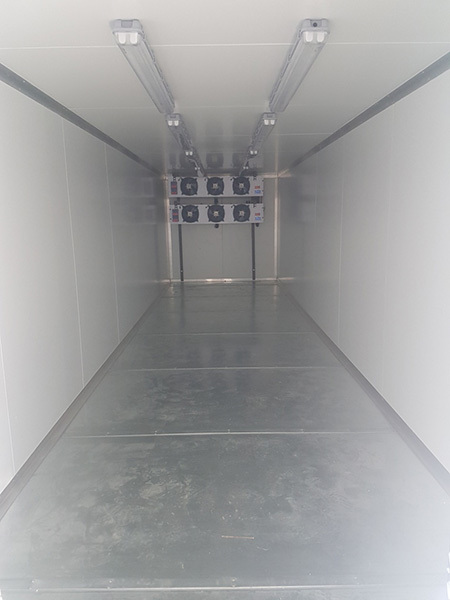 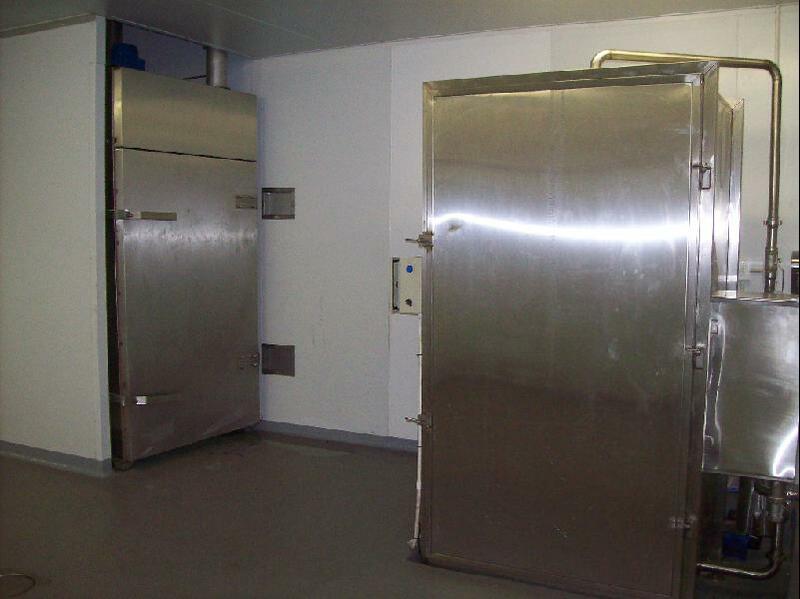 This combination cold room and freezer room was manufactured and installed by Swift-Air, the freezer room is used to keep food frozen and the cold room is used to keep food at low temperatures below 5 degrees celsius. 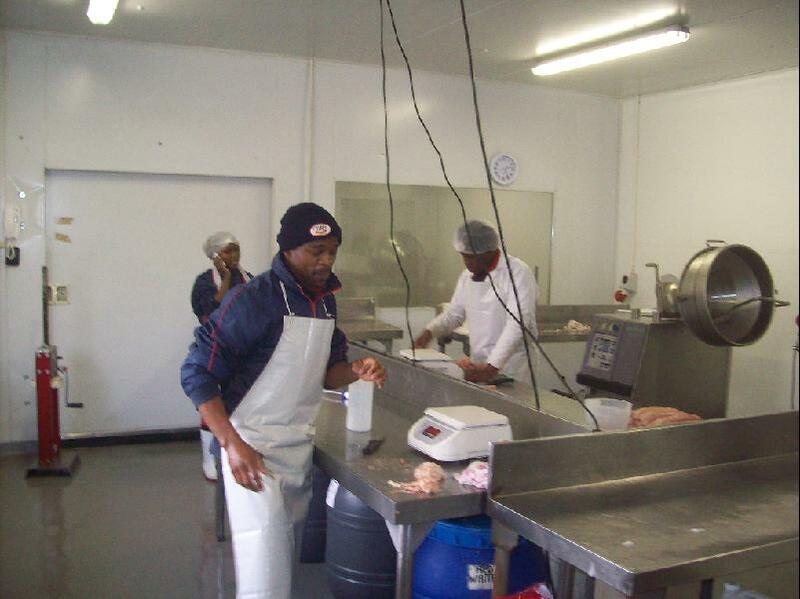 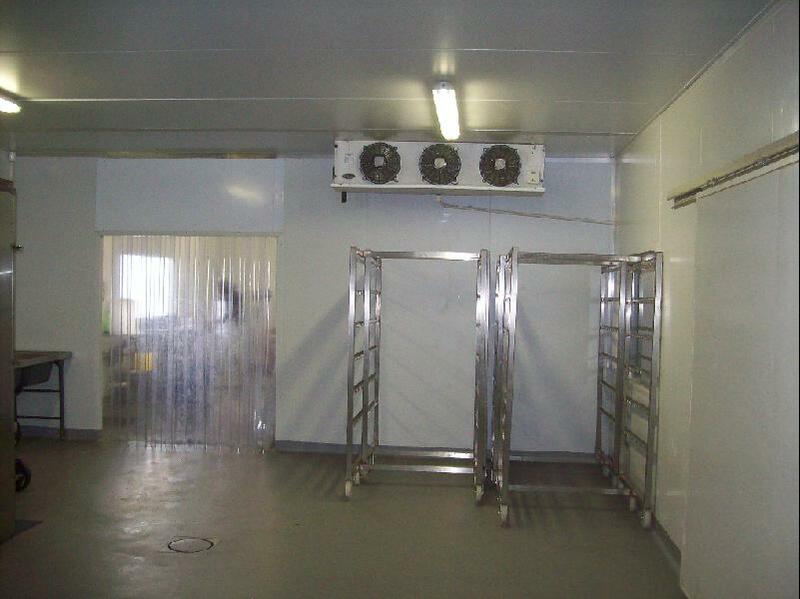 Both the cold room and freezer room are fitted with shelving & the cold room is also fitted with a stainless steel table to process food and vegetables. 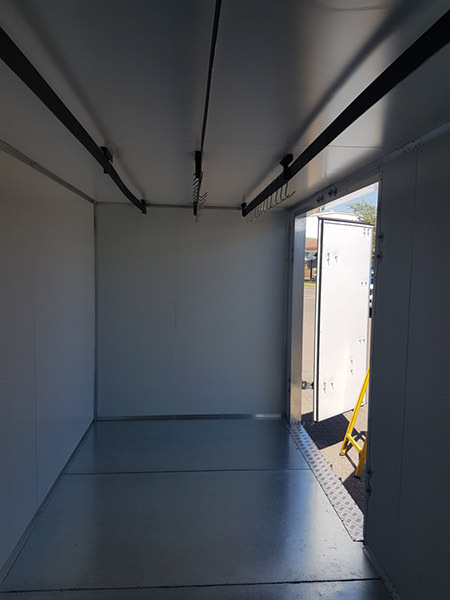 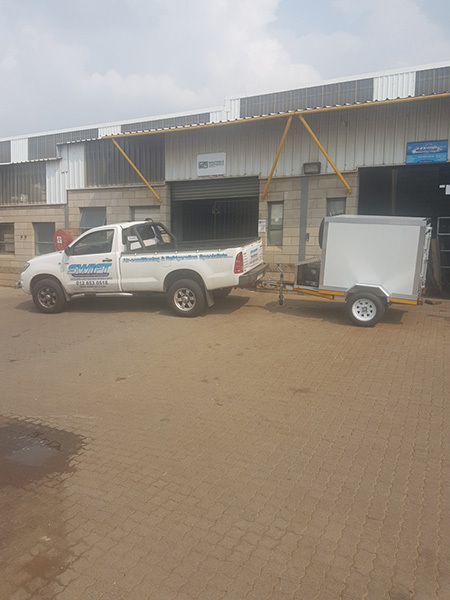 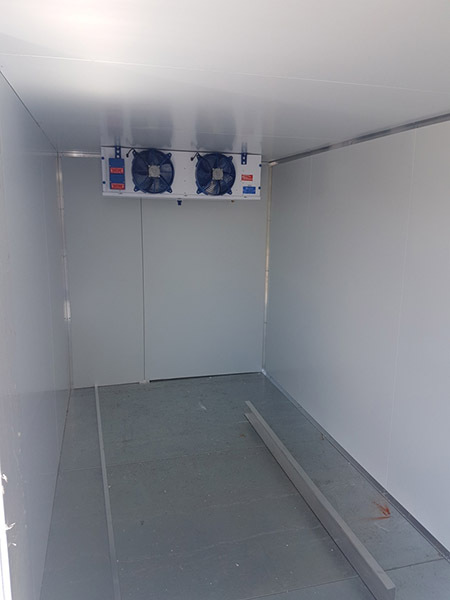 This is a double axle mobile cold room running on 4 wheels, the mobile cold room by itself weighs roughly 750Kg's unloaded and without extra's, just a standard mobile cold room. 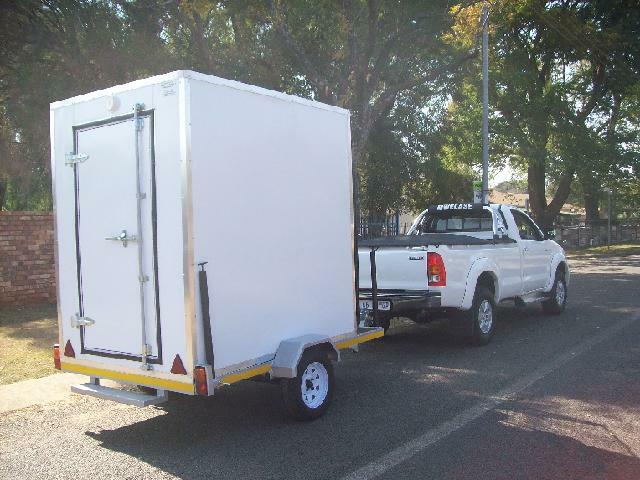 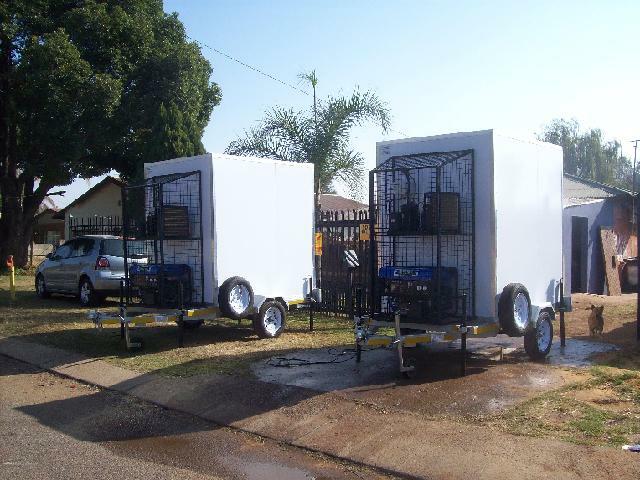 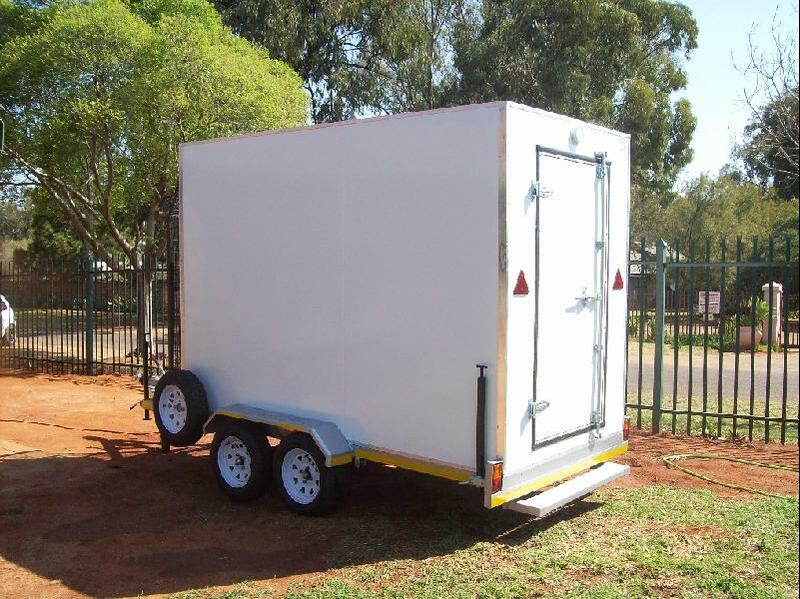 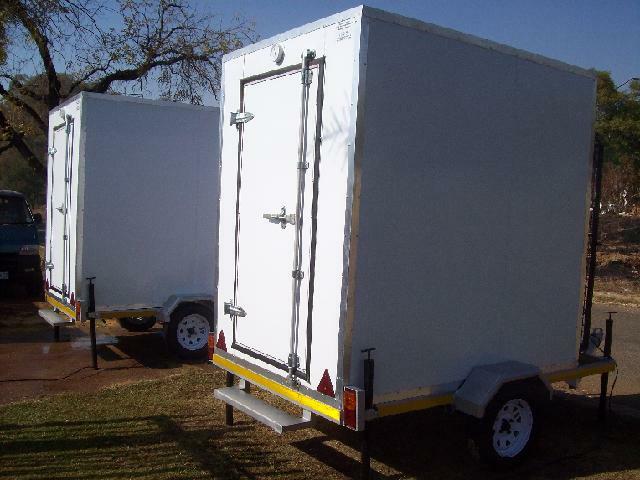 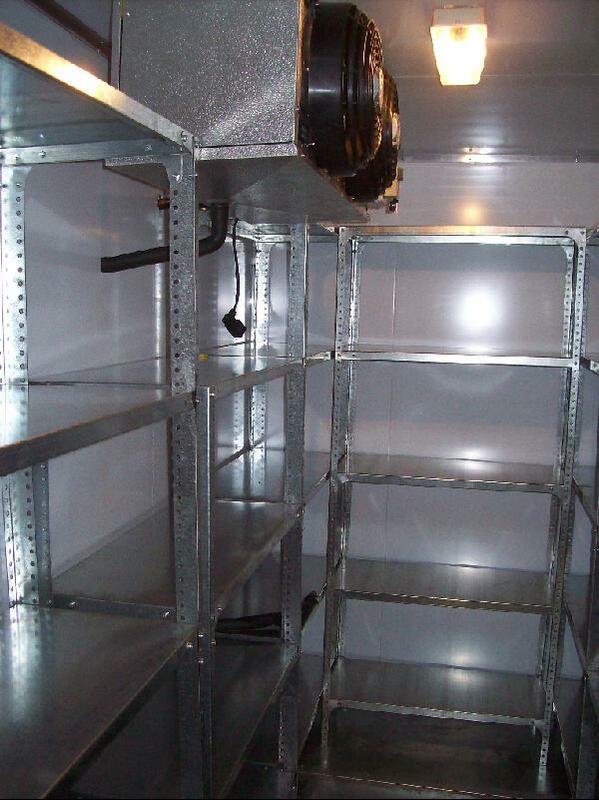 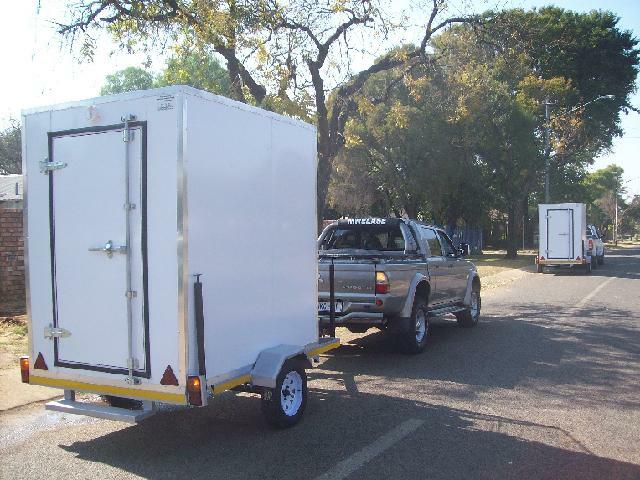 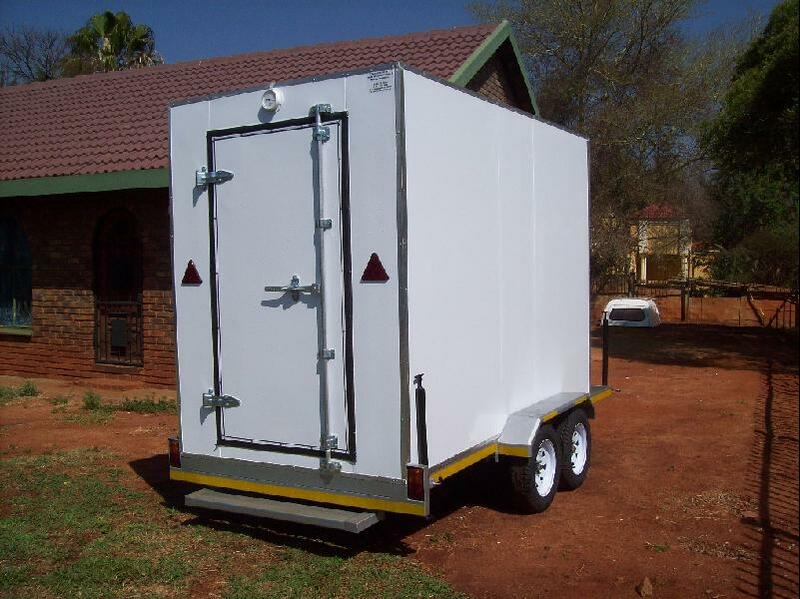 This mobile cold room is designed to carry products to the weight of up to 1500Kg's when fully loaded. 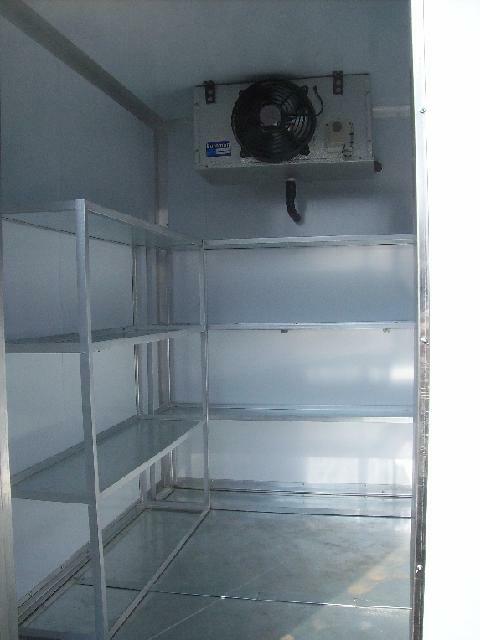 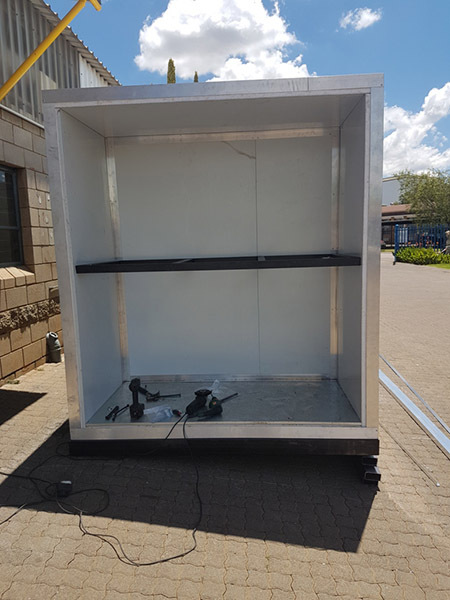 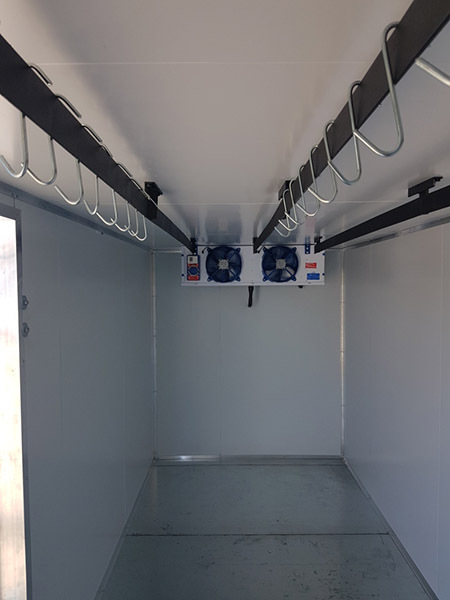 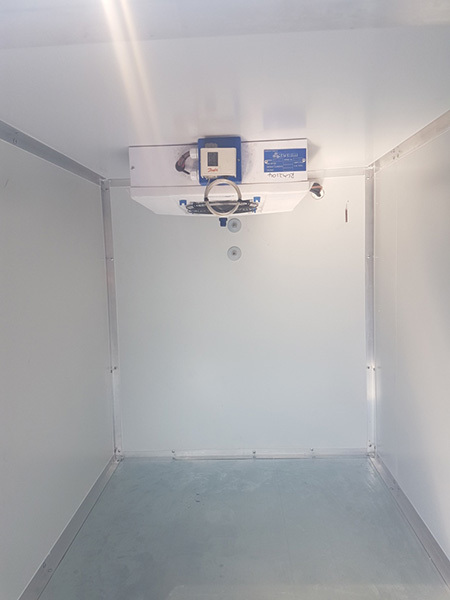 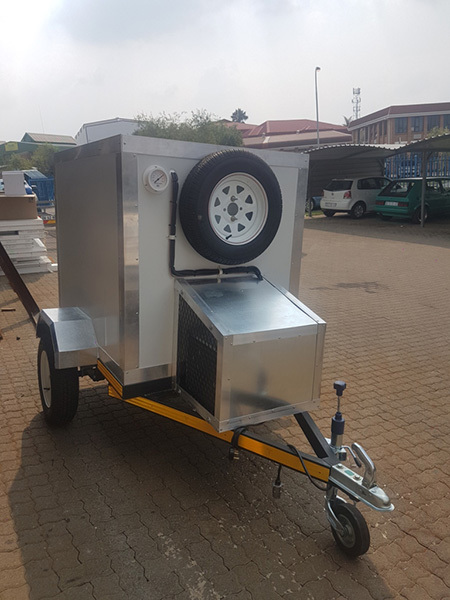 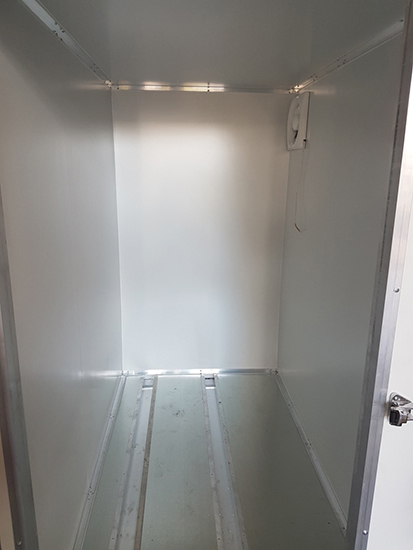 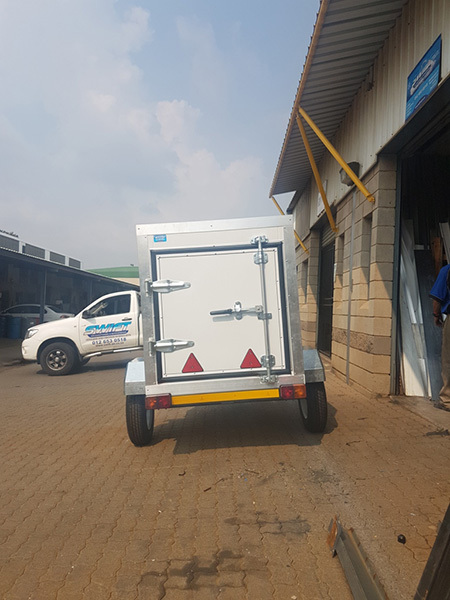 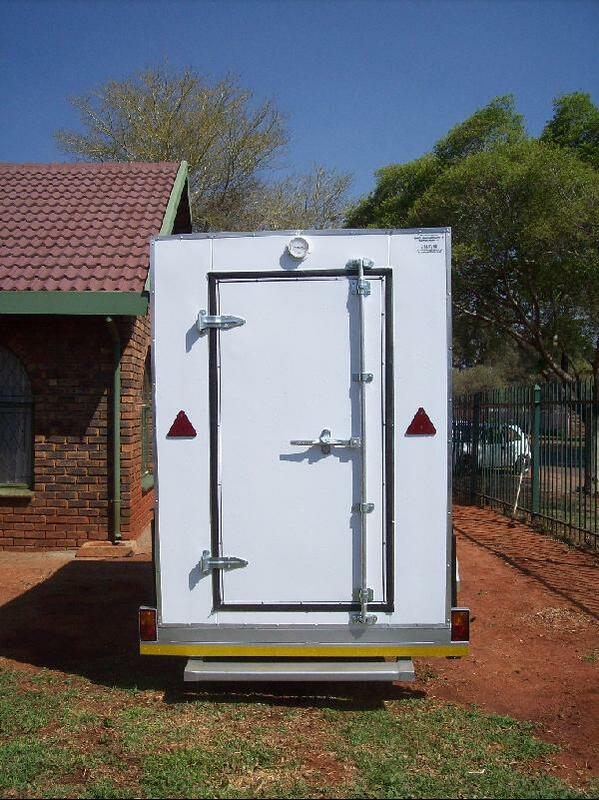 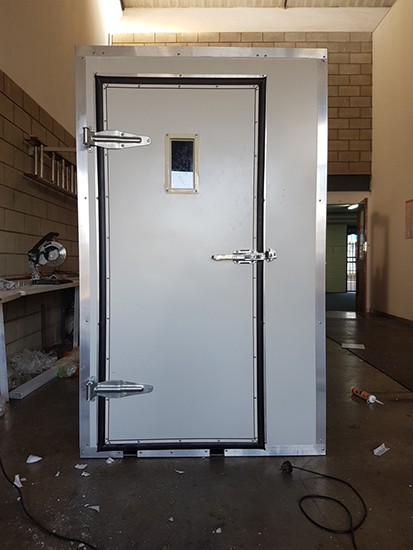 The use of this mobile cold room is universal (dual temp), any products that need to be kept at temperatures of 5 to -20 degrees celsius can be stored in this mobile cold room. 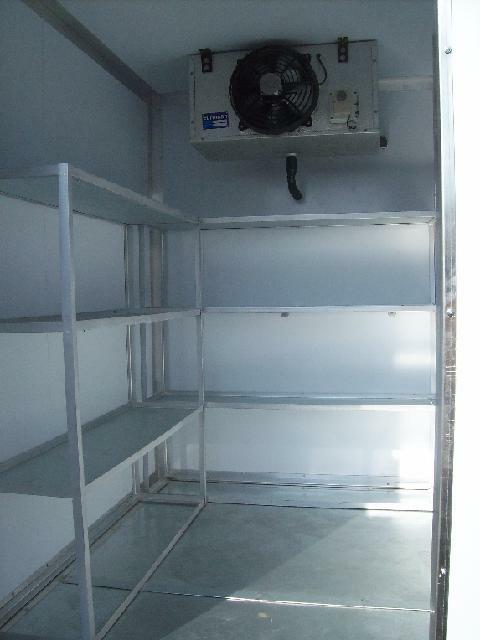 This mobile cold room & freezer room is sold to one of our clients who are hiring them out to the public and companies who uses them for outdoor events like, catering for weddings & funerals, they also have a big market for hiring out these mobile cold rooms and freezer rooms to sports events, music events and all types of outdoor events that has a need for cold rooms or freezer rooms, hunters also hire these units for hunting purposes. 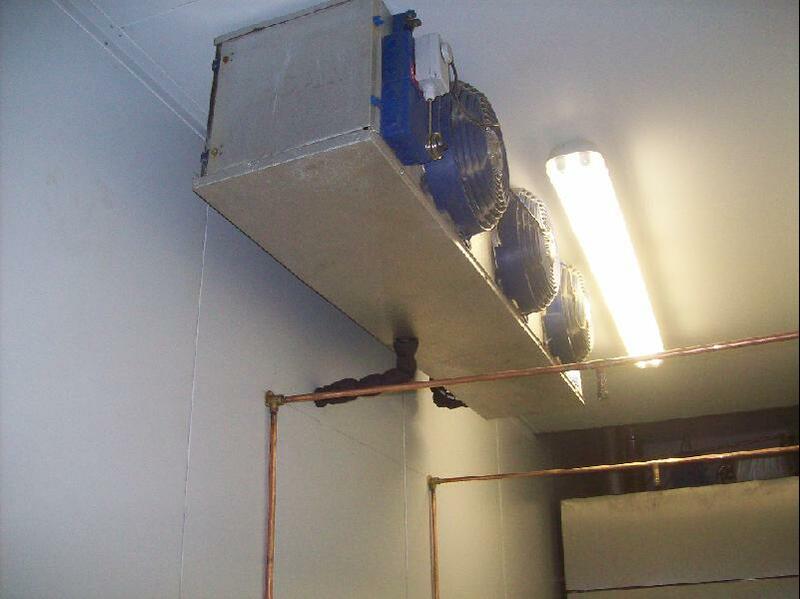 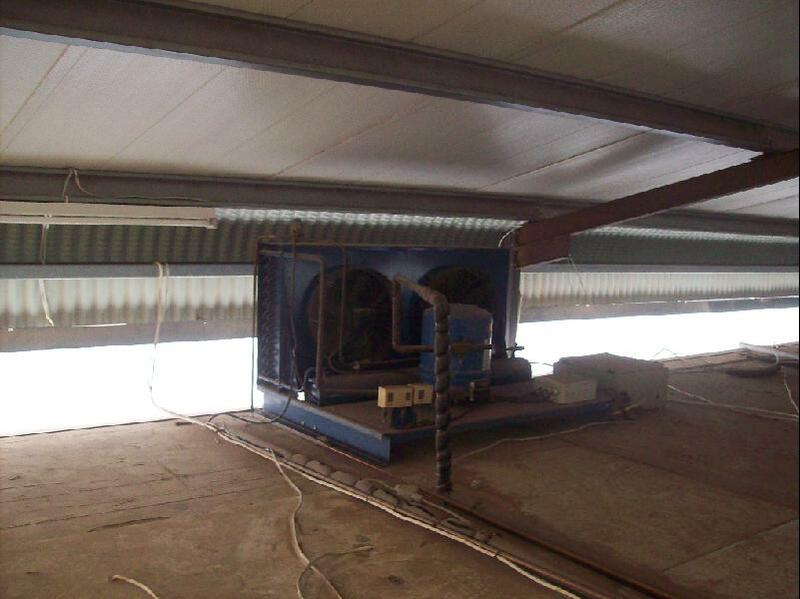 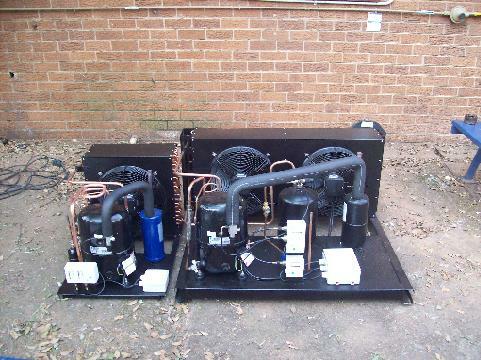 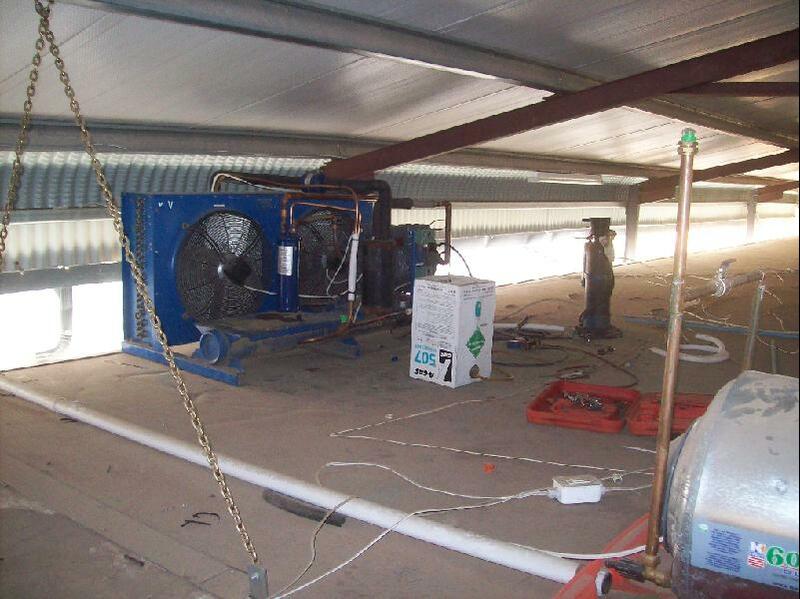 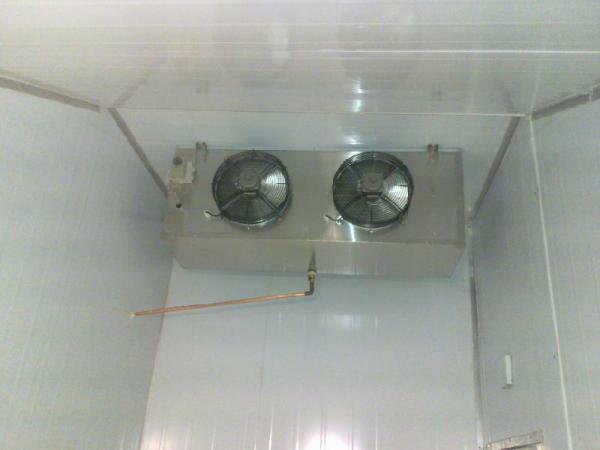 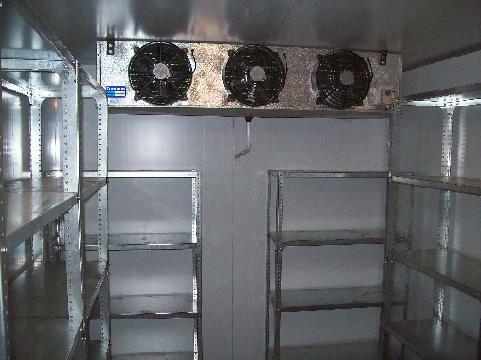 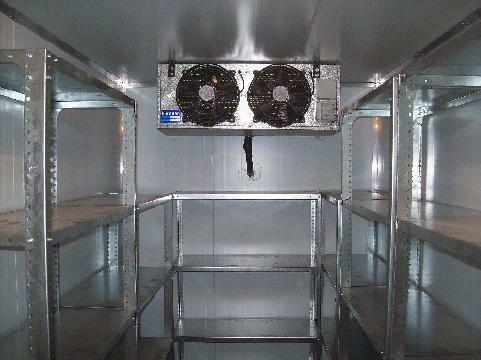 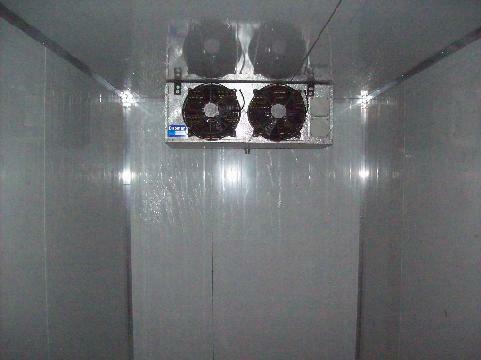 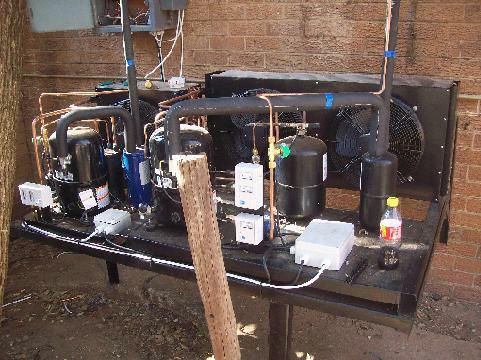 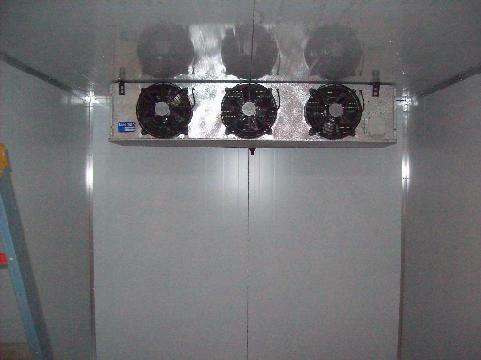 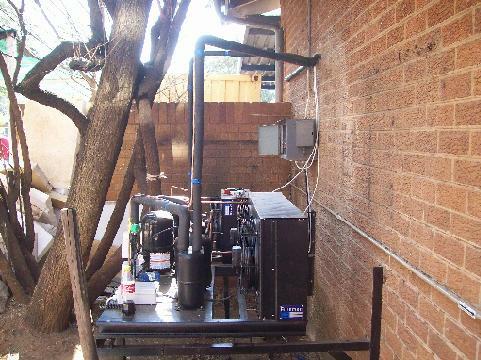 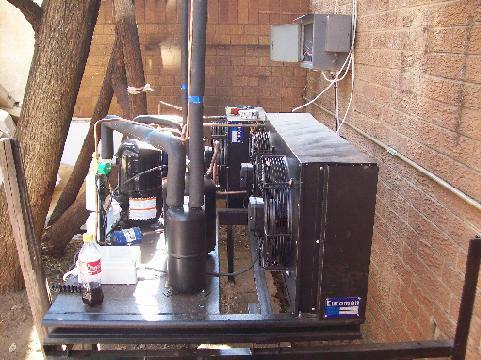 This cold room & freezer plant is a project completed by Swift Air-conditioning & Refrigeration cc. 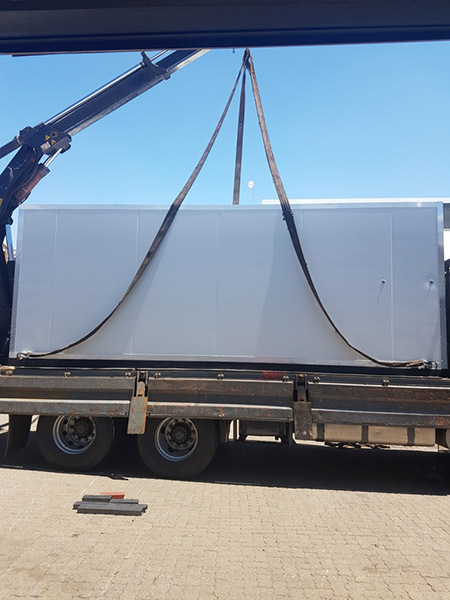 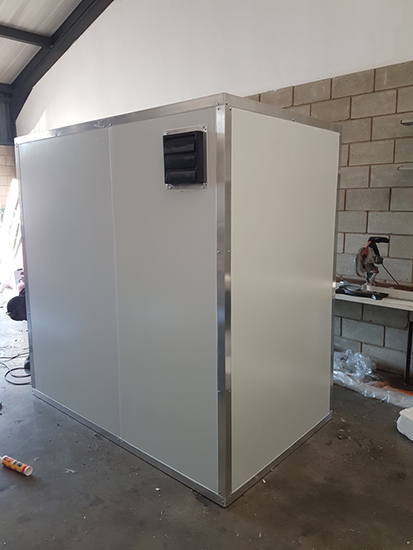 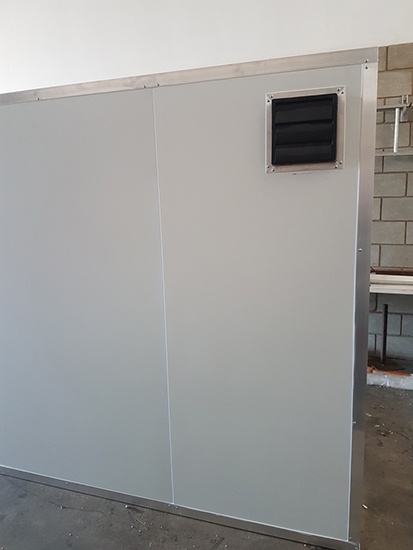 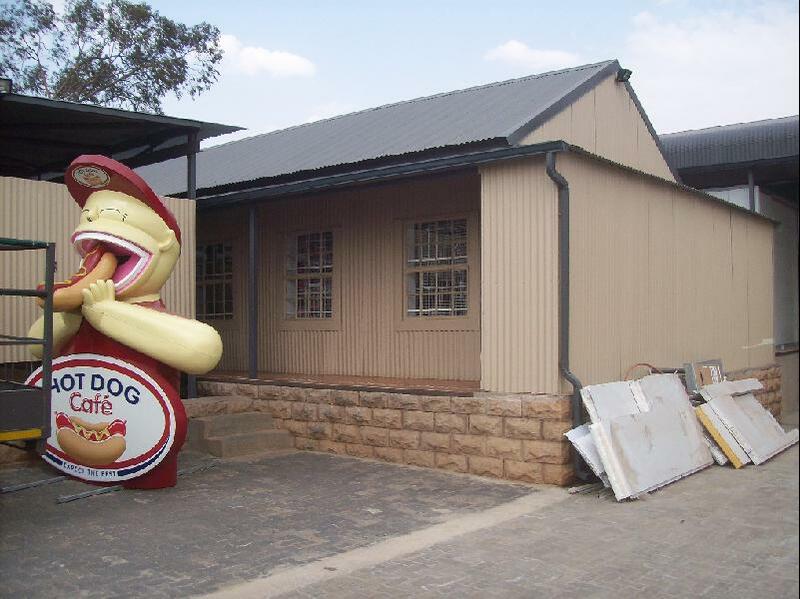 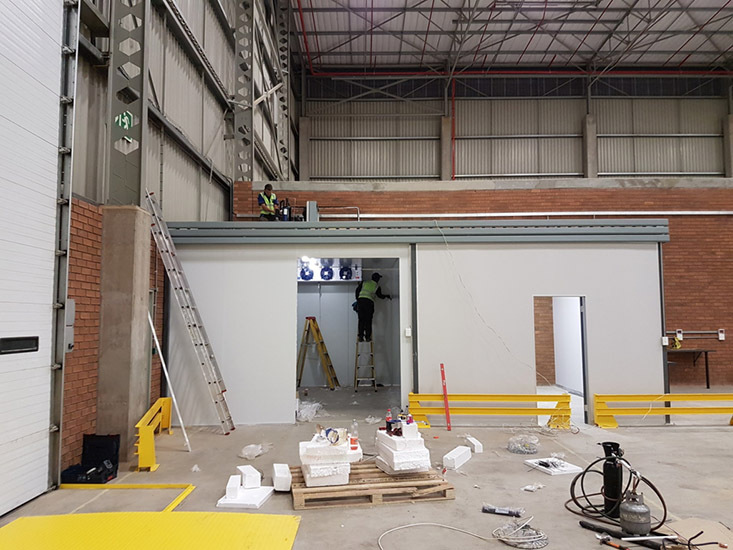 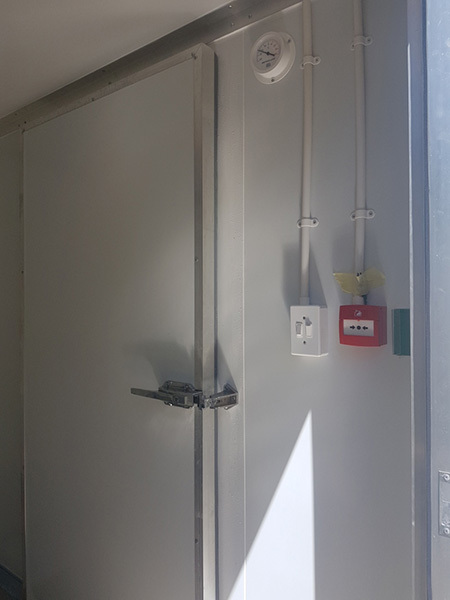 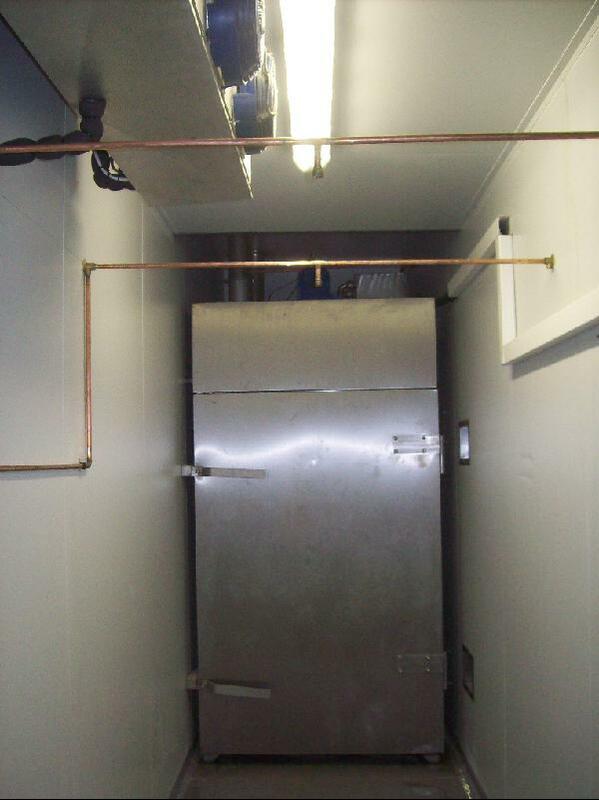 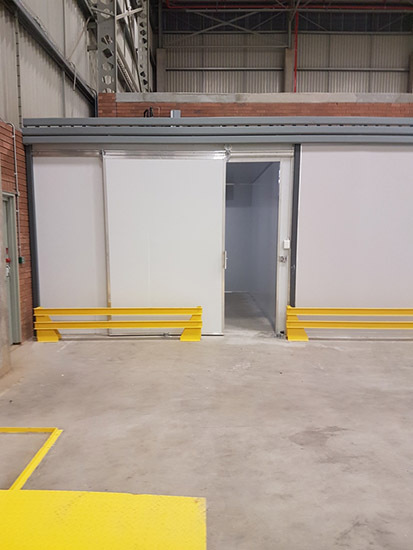 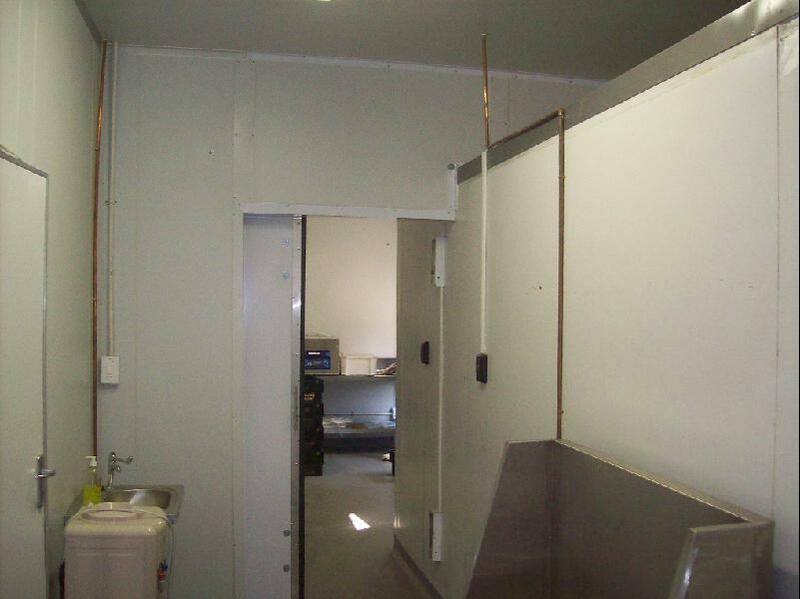 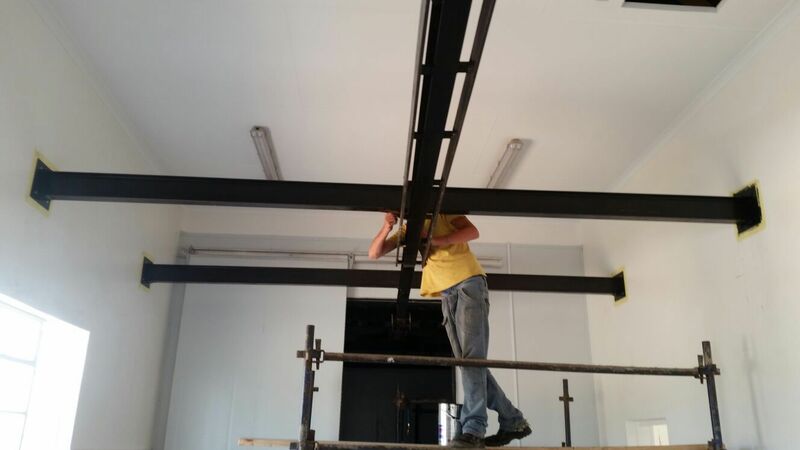 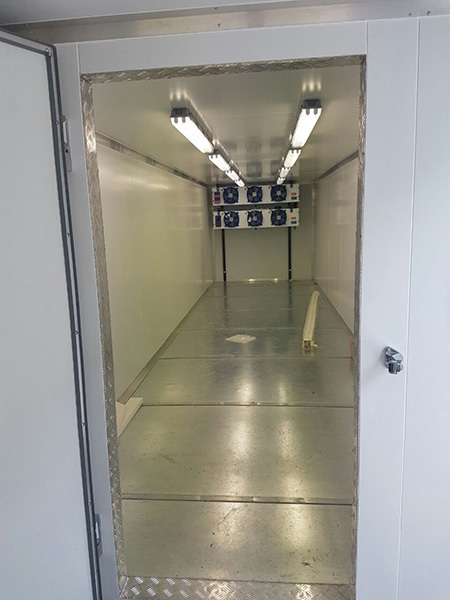 We installed a couple of holding freezer rooms, pull down freezer rooms drop temp cold rooms as well as holding cold rooms, the plant is used to produce sausages for Hot Dog Cafe's franchises all across the country and neighbouring countries as well. 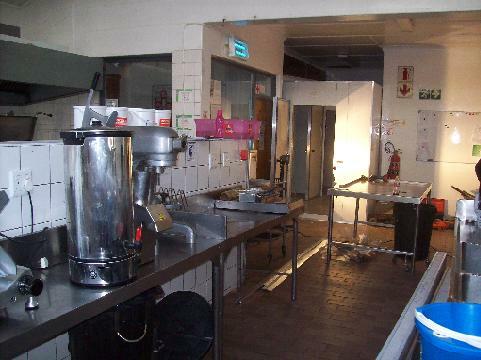 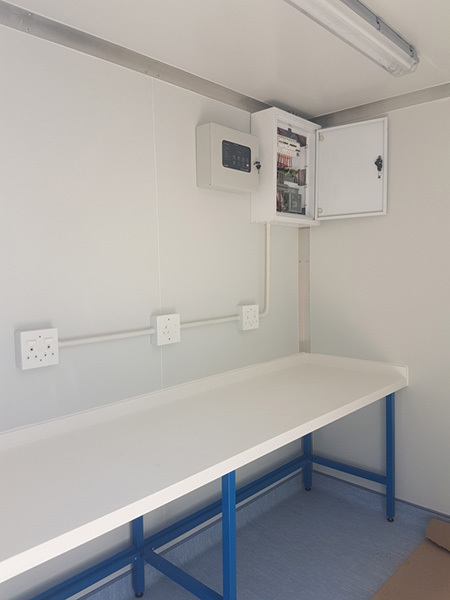 We manufactured and installed this combo cold room & freezer room and St. Albans College in Pretoria, the combo cold room & freezer room is used in their kitchen to store and prepare food for the students, the freezer room is normaly used to stock frozen foods to keep them frozen and fresh, and the cold room is to keep perishables fresh like dairies and salads. 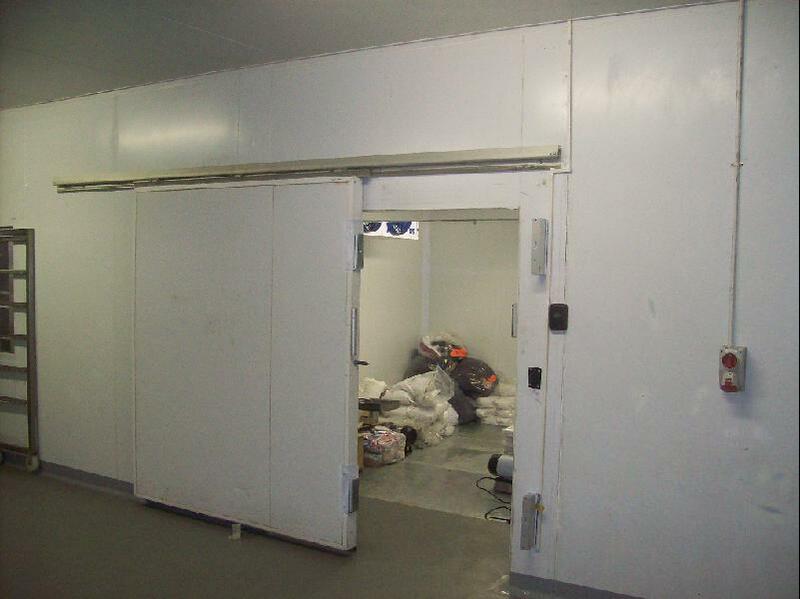 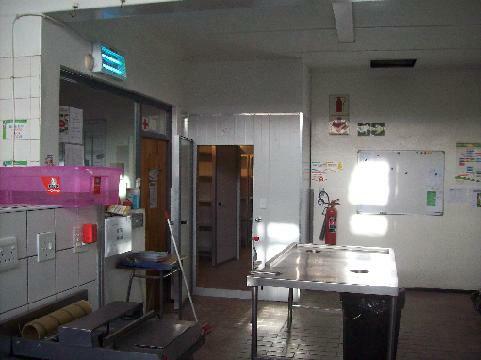 The combo cold room & freezer room is commonly built where both units are required to store products on site, like restaurants, hotels, schools etc. 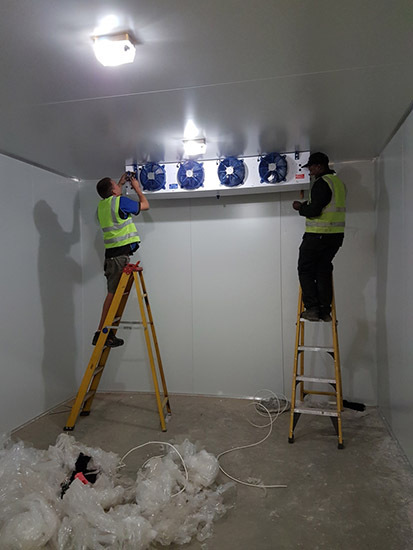 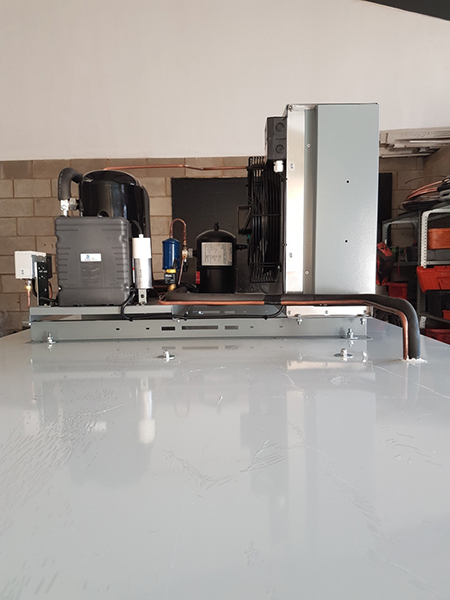 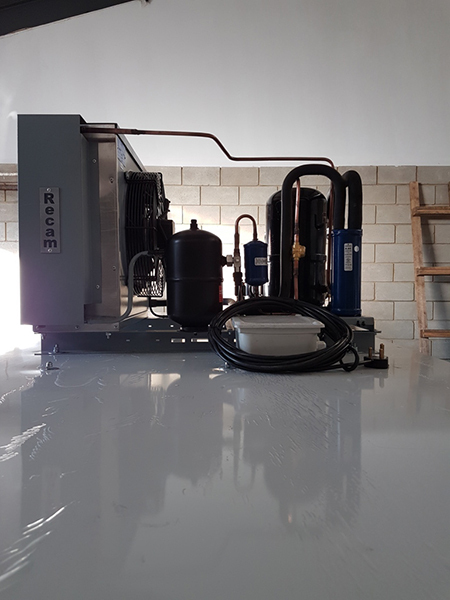 Installing a combo cold room & freezer room for your refrigeration requirements are a cheaper option than to have 2 seperate cold rooms or freezer rooms. 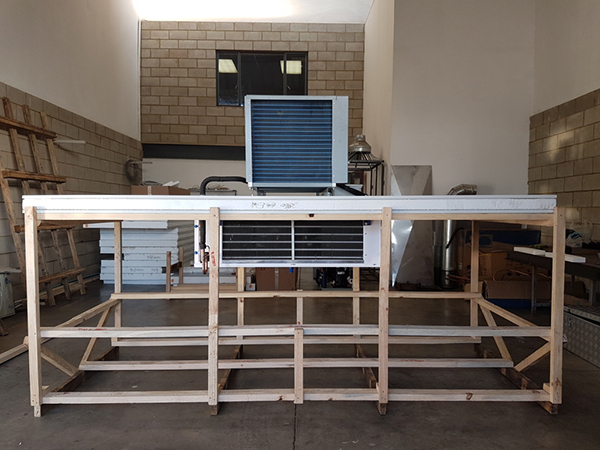 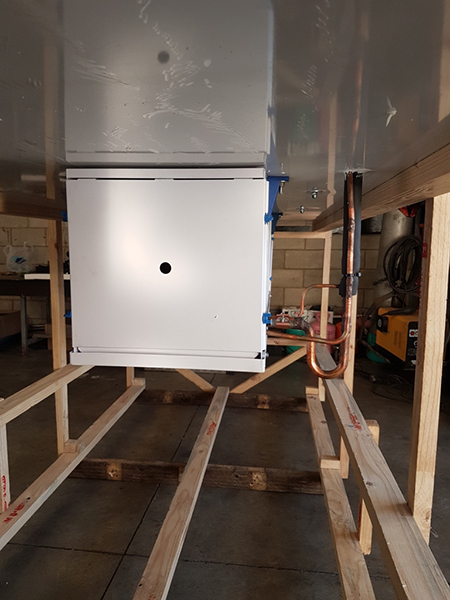 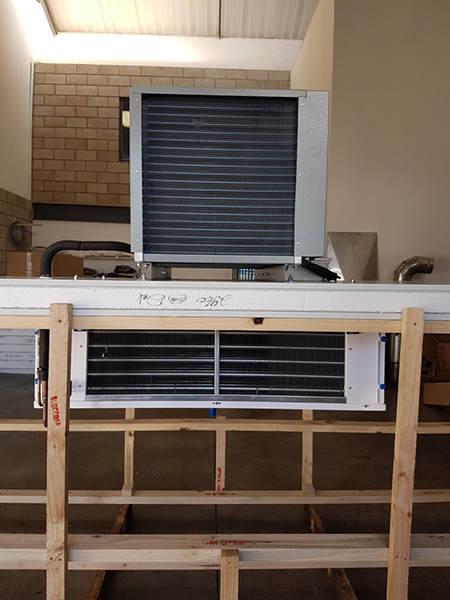 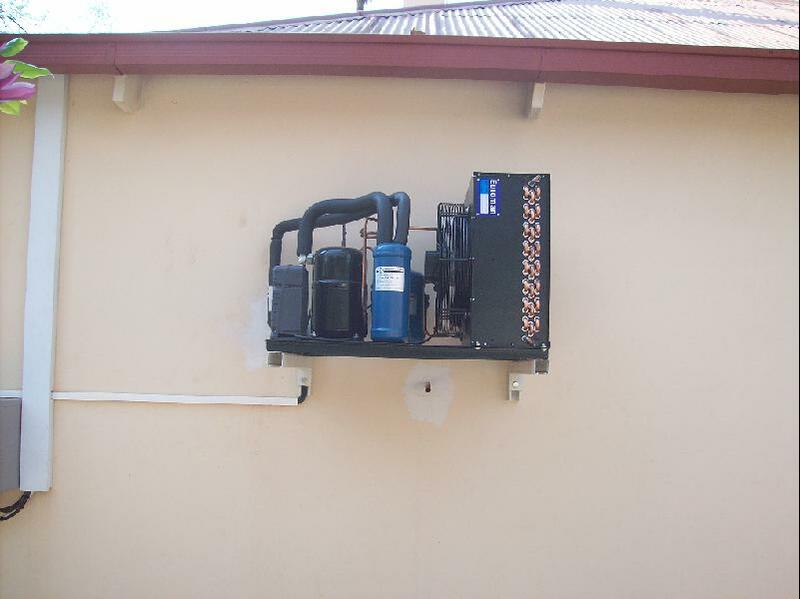 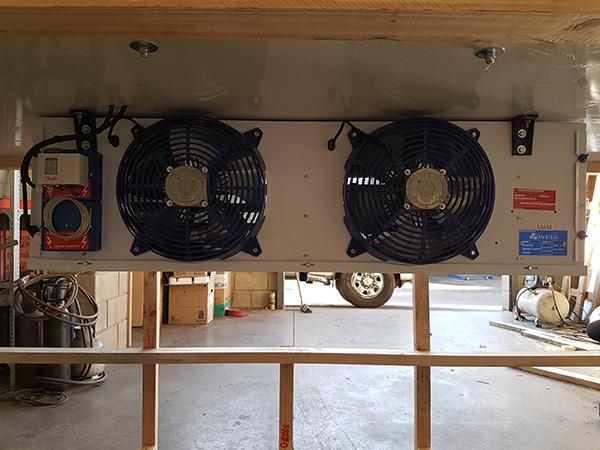 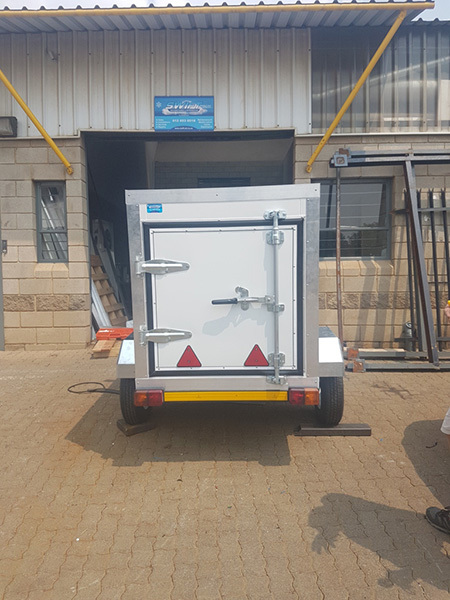 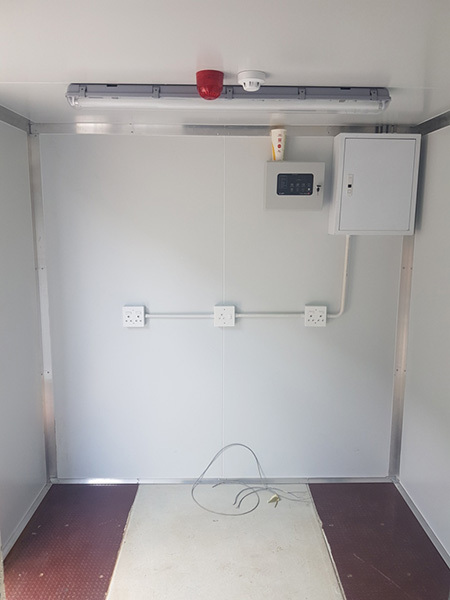 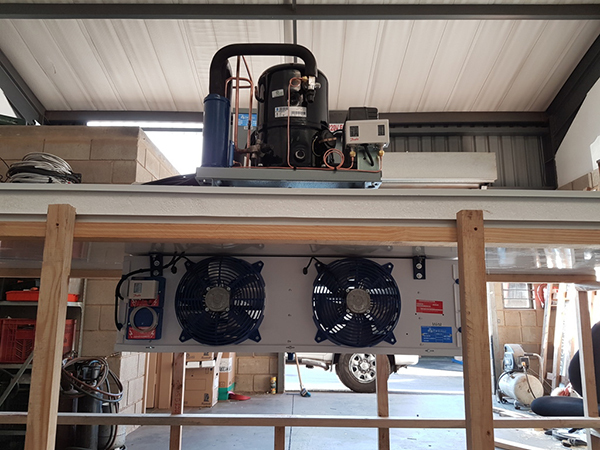 This DIY cold room is manufactured by ourselves, it is ordered from Zambia for n game farm to keep hunted carcasses fresh, the client has zero experience in the assembly and installation of cold rooms, however, our DIY cold rooms are very simply to assemble, it is supplied with a drawing that makes it very easy to do it yourself, the refrigeration (condenser & blower) has been installed on a roof panel, the panel must simply be assembled to the rest of the room and the the refrigeration must just be plugged into a 220V power supply to make it work, Easy does it!!! 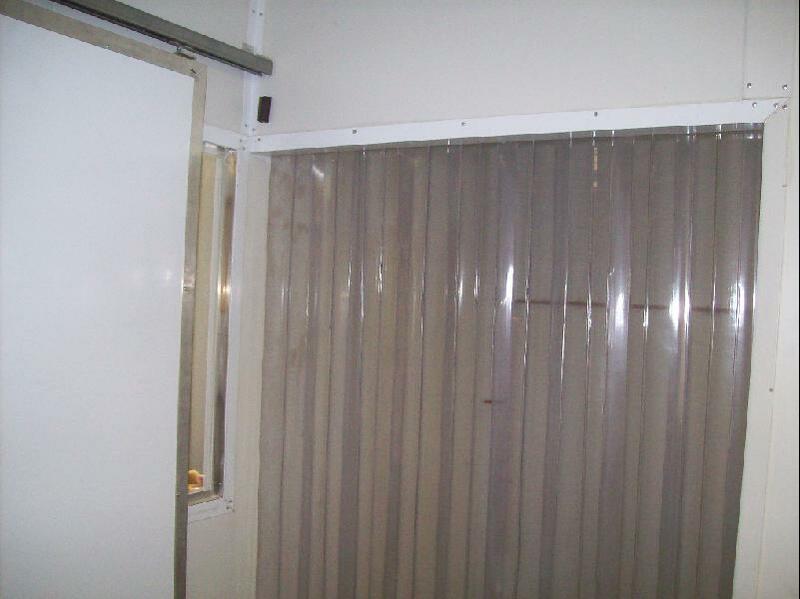 We manufacture egg hatchers according to client's specification, we use insulated cold room panels to build the box, we use cold room container doors for better insulation that seals flash with the insulated panel, within the door is a glass inspection window, the size is up to the client, it can be a small window or a full door size window, These egg hatchers are manufactured in South Africa and can be exported to anywhere in the world, we are registered exporters, we take care of everything, from manufacturing to logistics. 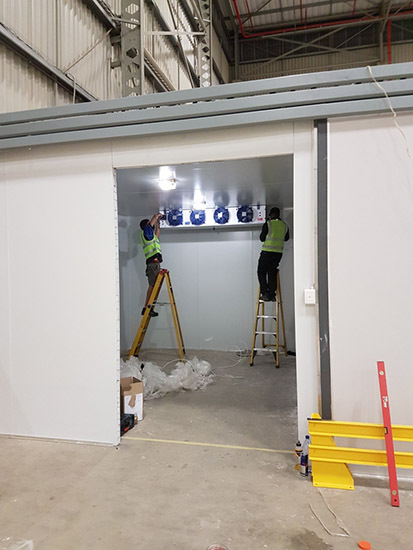 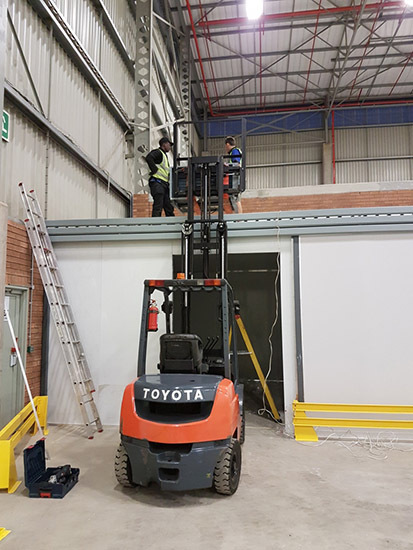 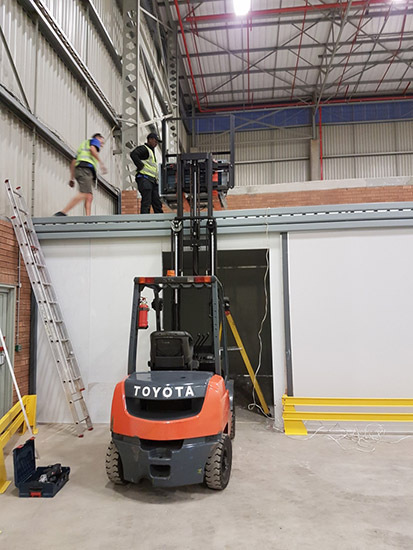 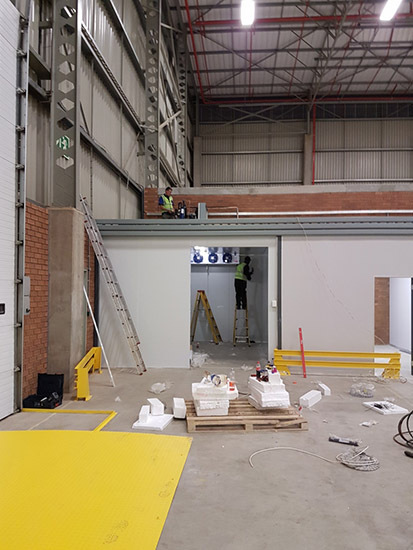 This 5 x 4 x 3m H cold room was manufactured and installed by our proud team of tecnicians, the deadline was tight and we worked the final day way into the night, however the project was completed at 4am on a Saturday morning and handed over to the project manager, who was needless to say more than impressed with our acomplishment. 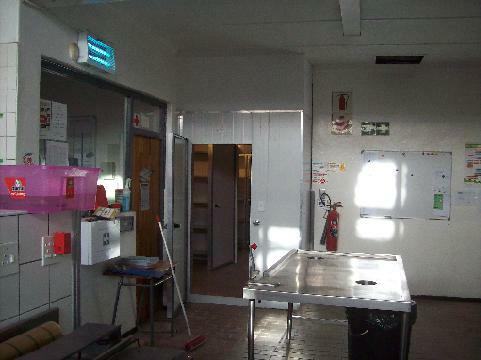 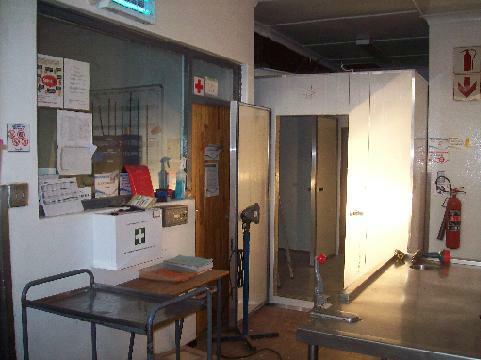 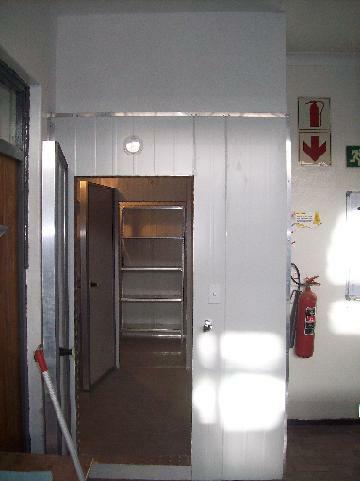 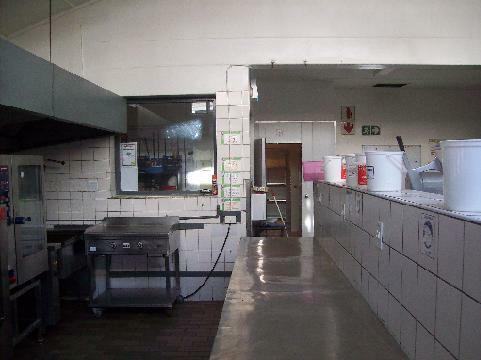 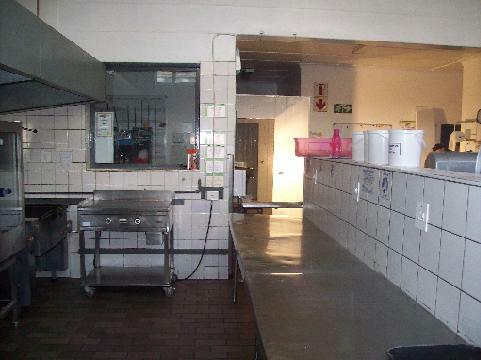 The cold room is used to store chemicals at a distribution warehouse in Germiston. 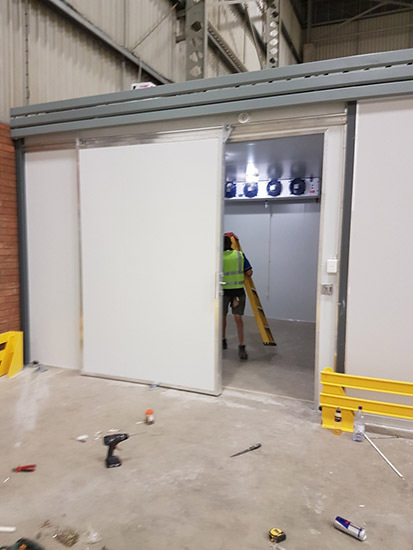 As you can see on the photos all the trimmings and finishes including the sliding door has been completed with great attention to detail on this cold room. 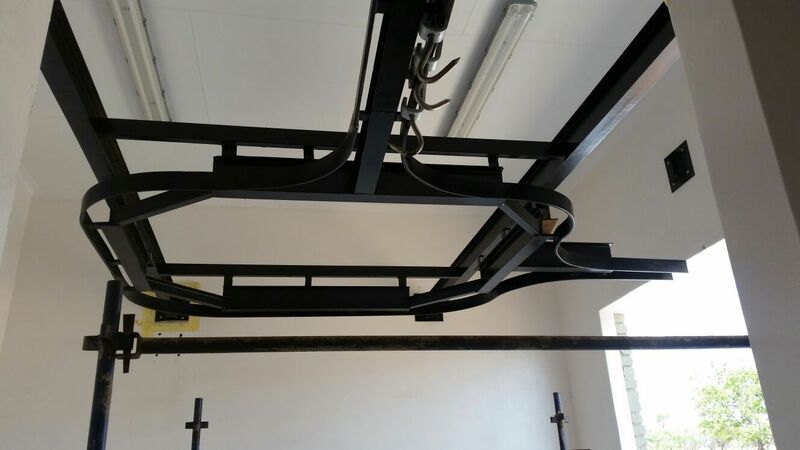 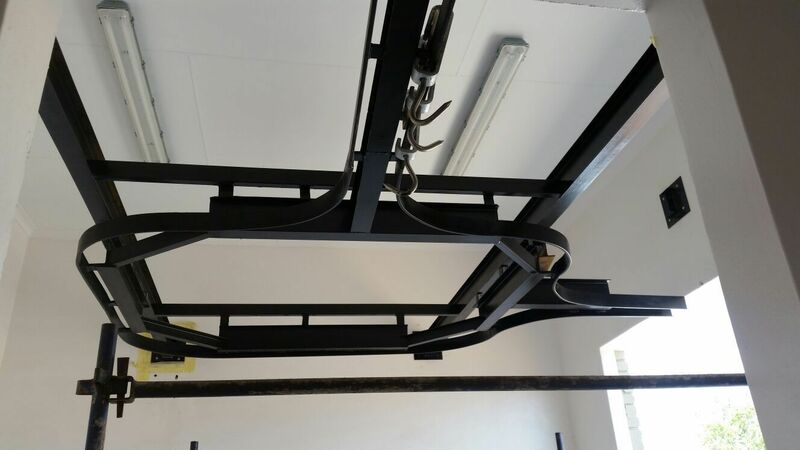 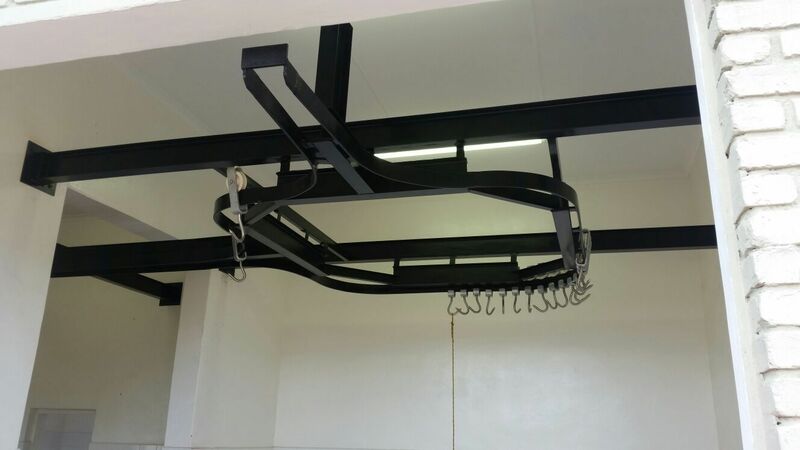 We manufacture & install industrial & commercial meat rails, our aim is to assist clients in the meat industry with whatever meat rail requirements they might have, we meet on site, do an assessment of the facility, then sit down with the client to discuss their needs, we then take care of the drawing, get approval from the client, and then start manufacturing the rails from scratch as per the client's instruction. 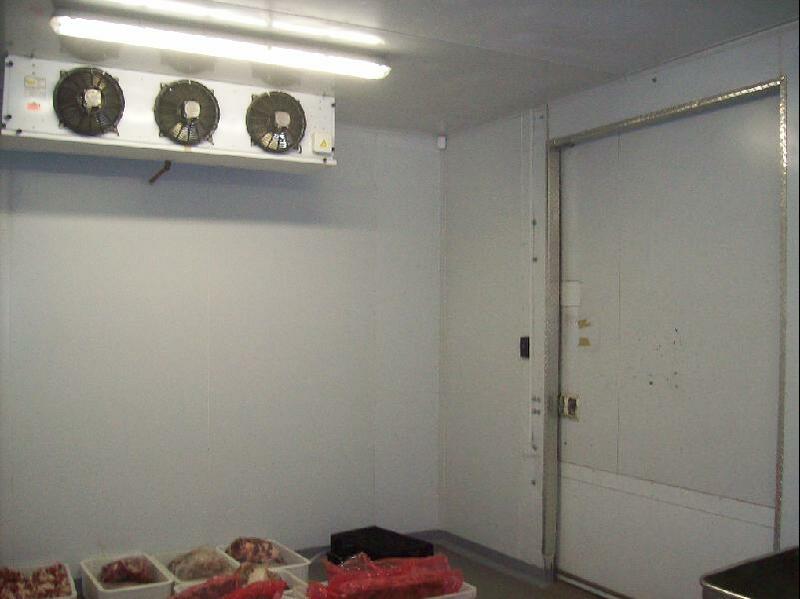 For any of your meat rail needs, we are only a phone call away. 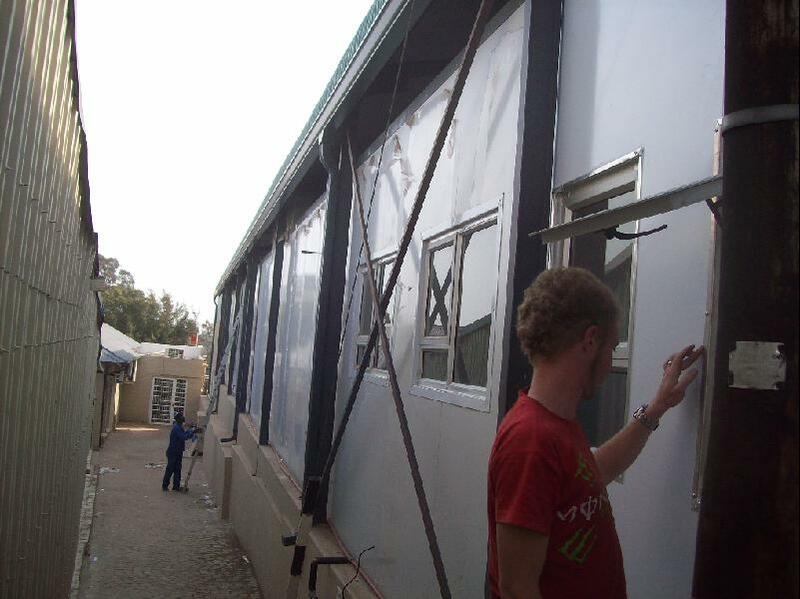 we supply National & International clients with our products & services. 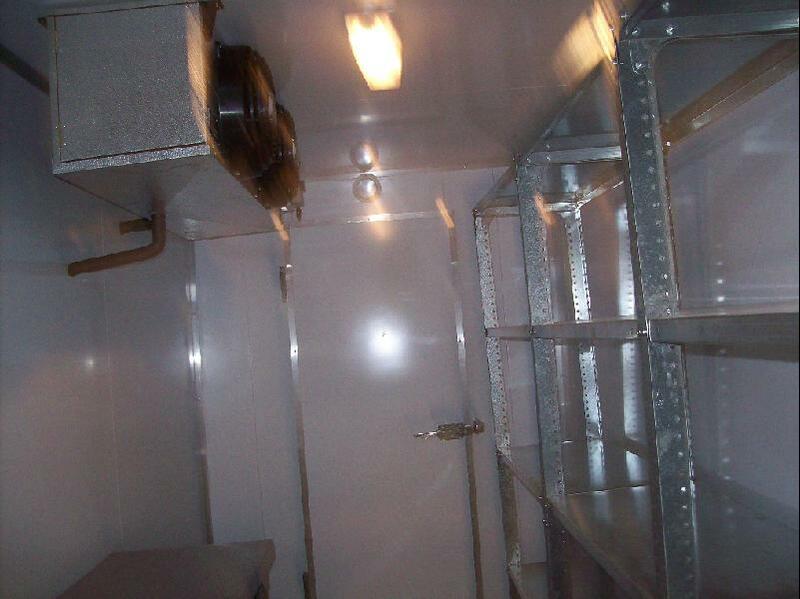 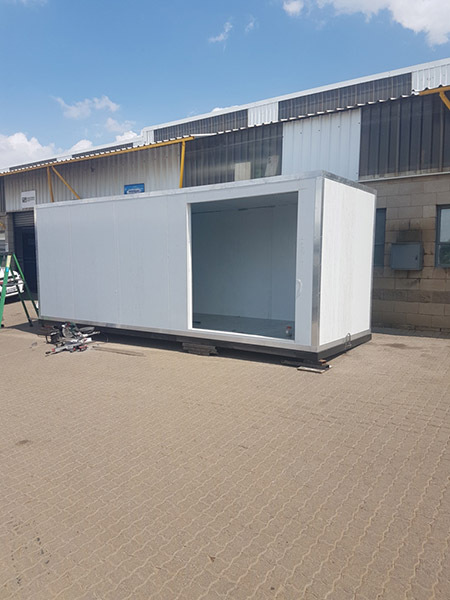 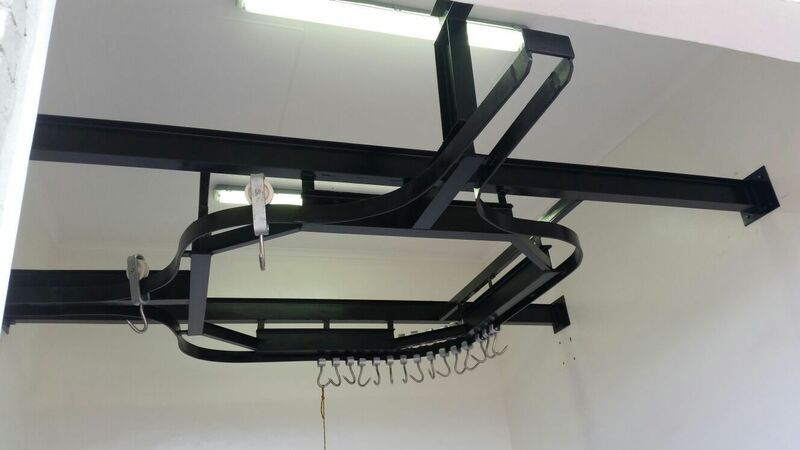 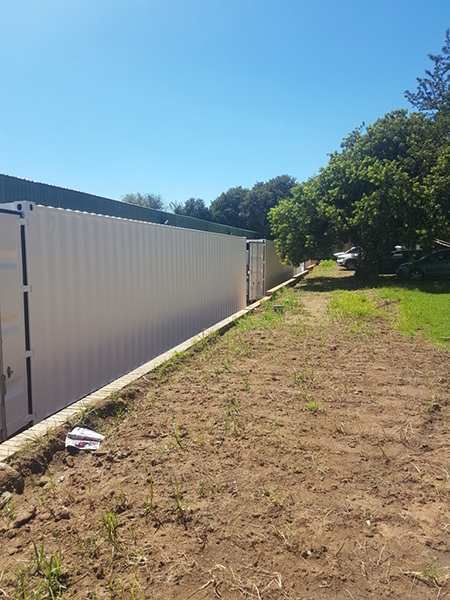 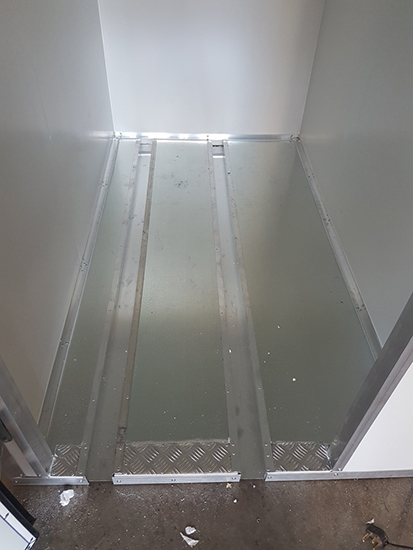 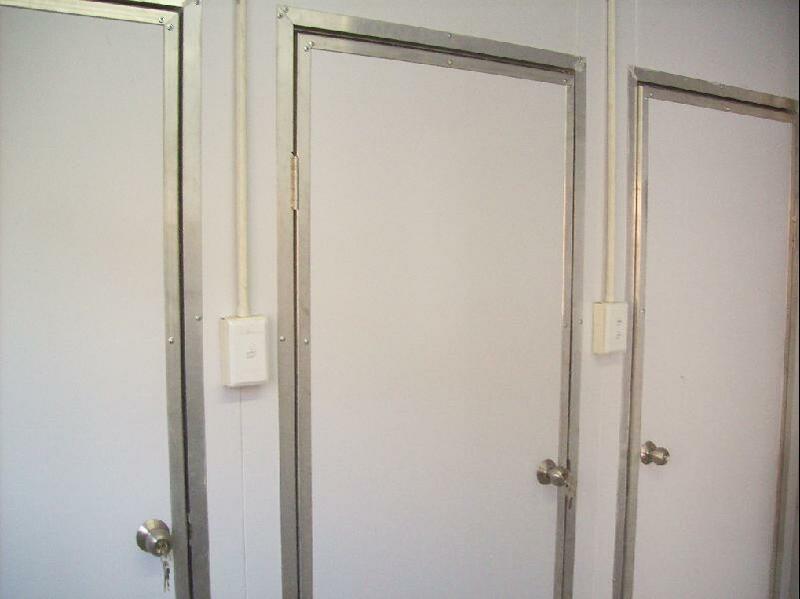 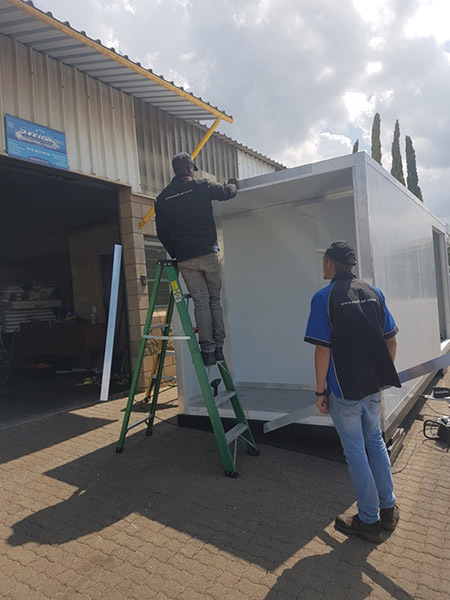 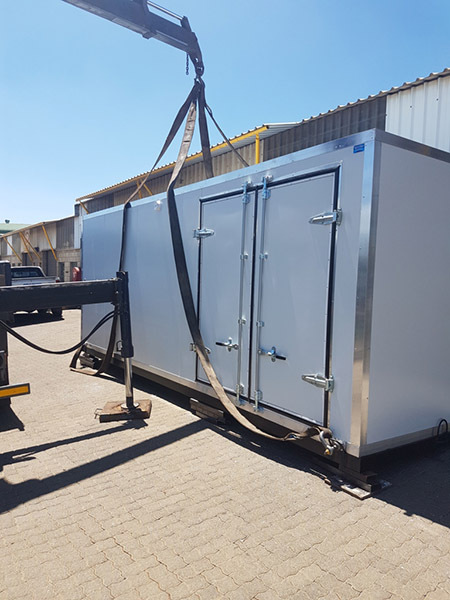 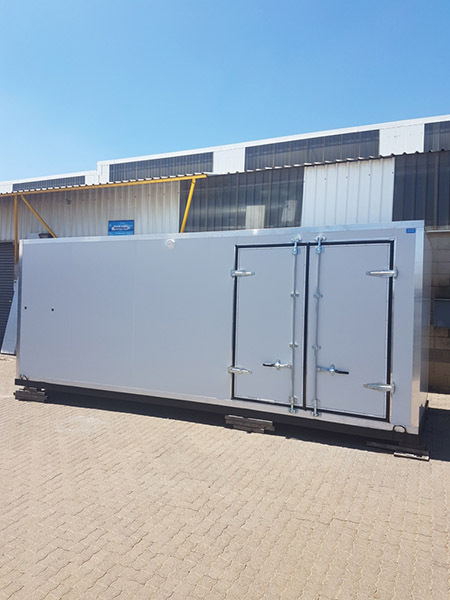 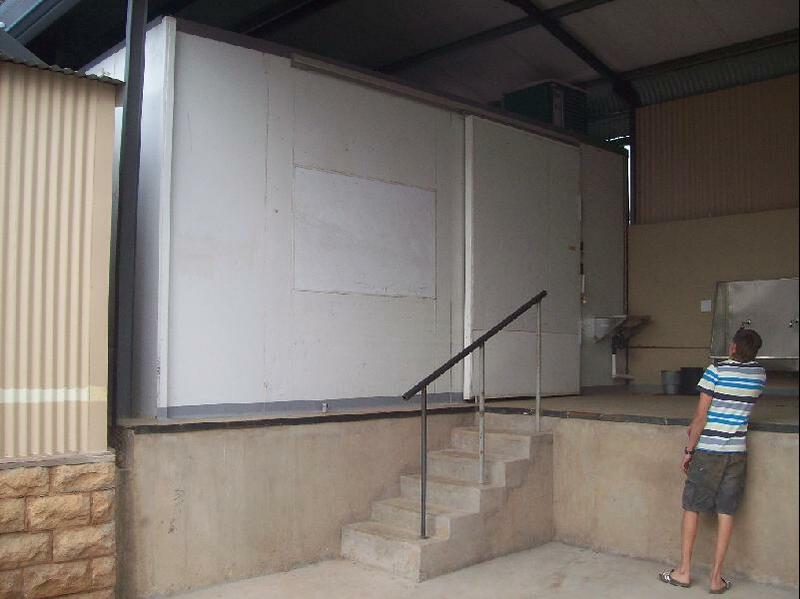 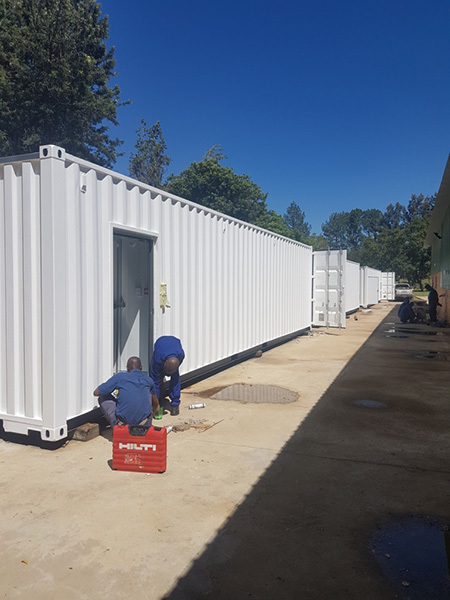 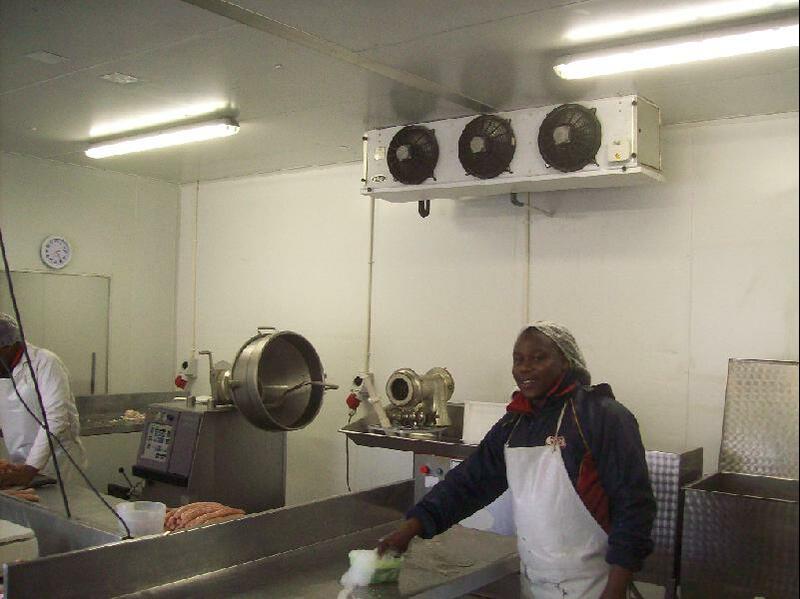 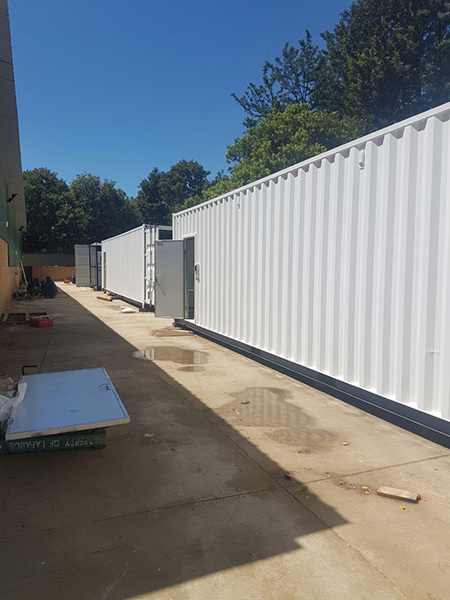 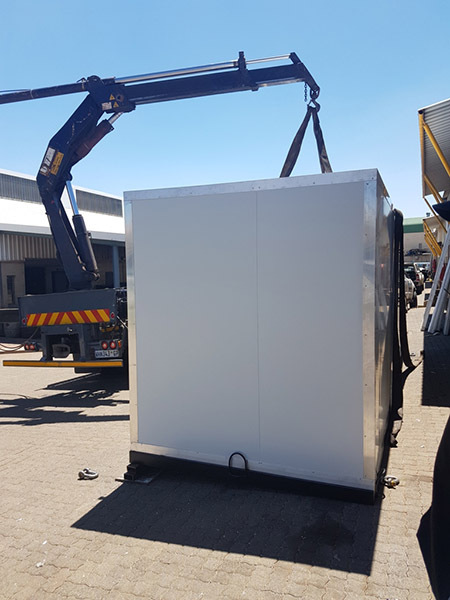 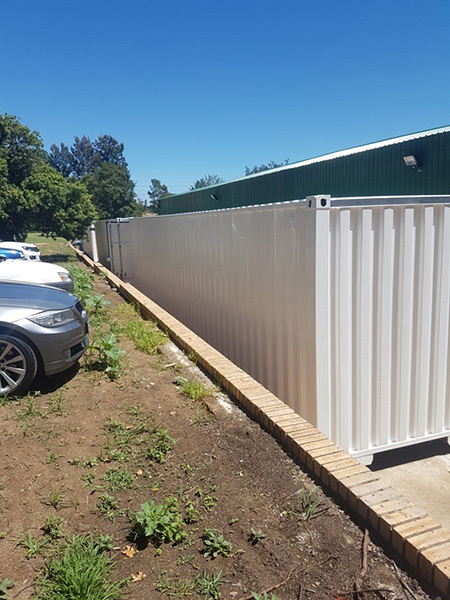 Our container cold & freezer rooms are manufactured with a strong durable steel base structure, it is also fitted with brackets that simplifies rigging of the units. 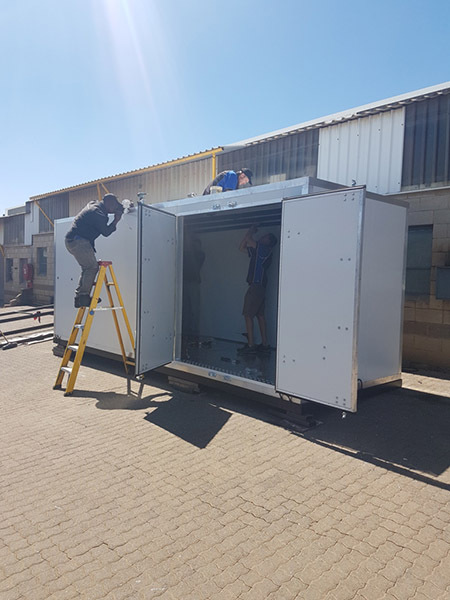 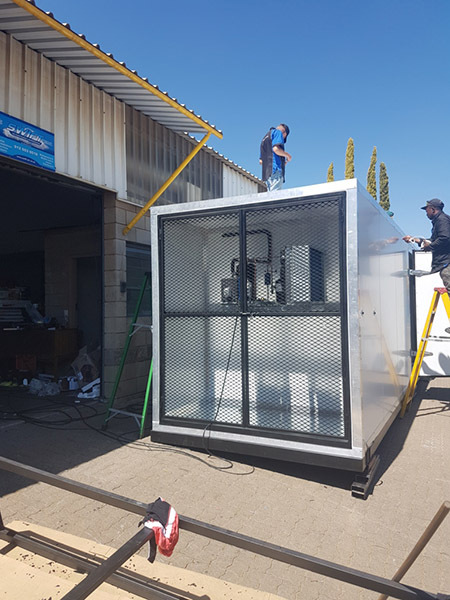 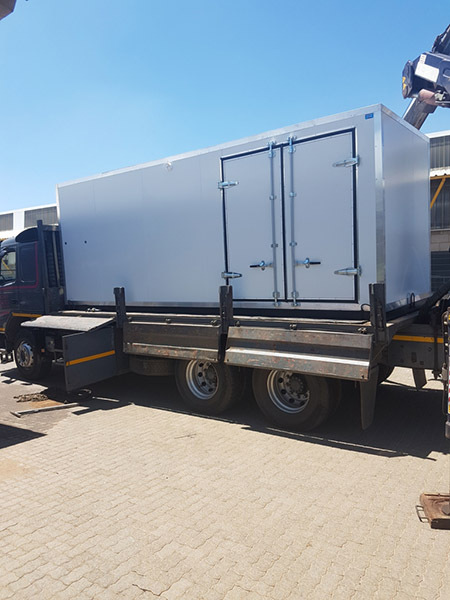 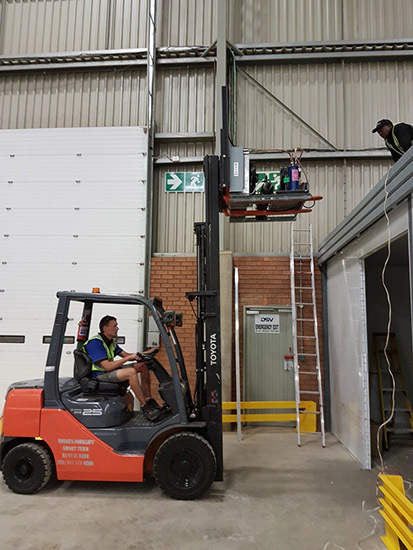 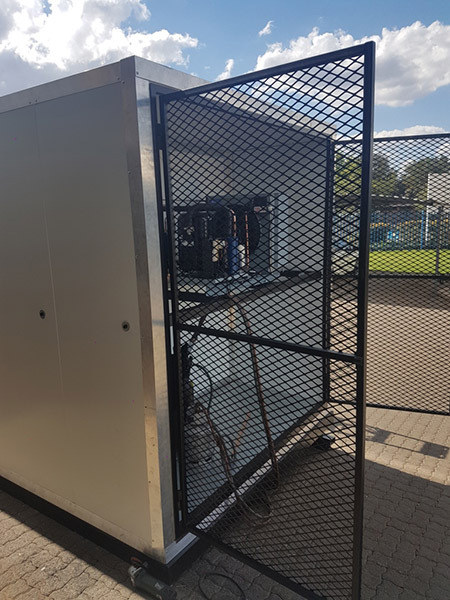 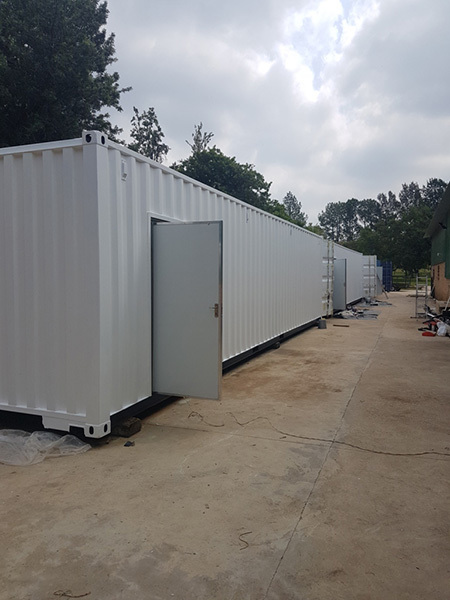 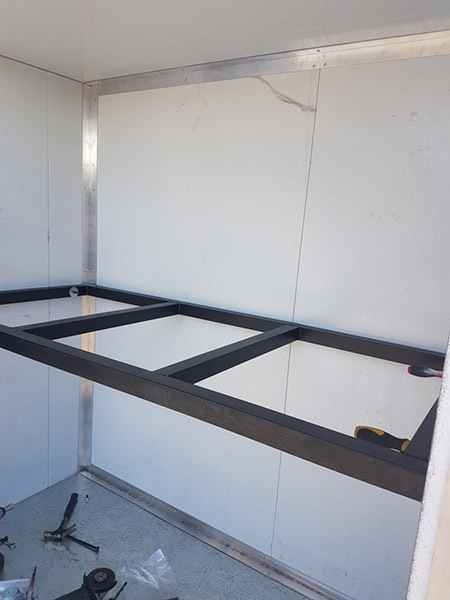 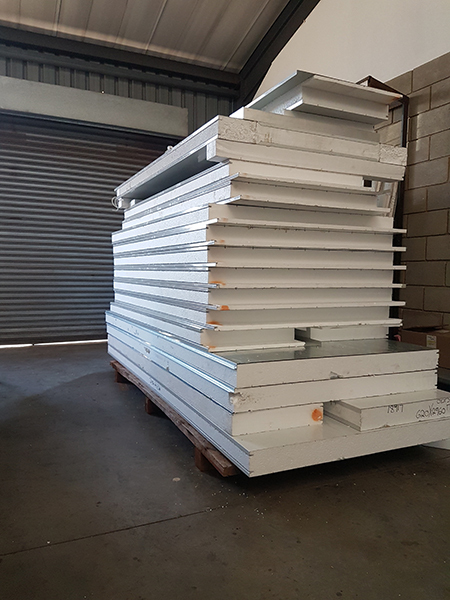 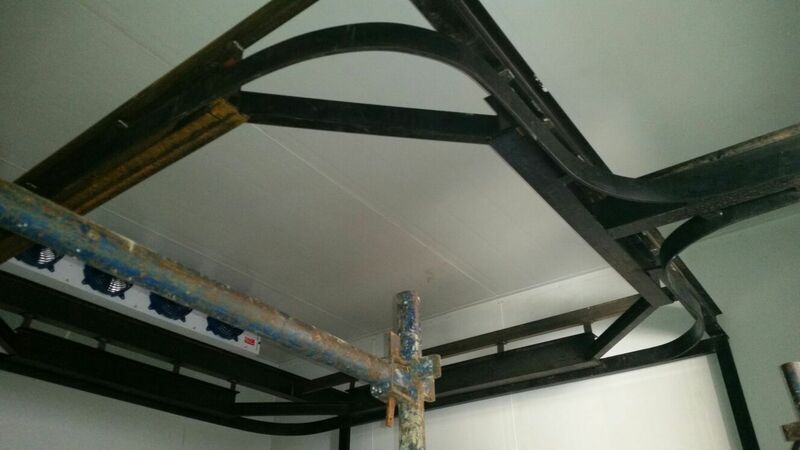 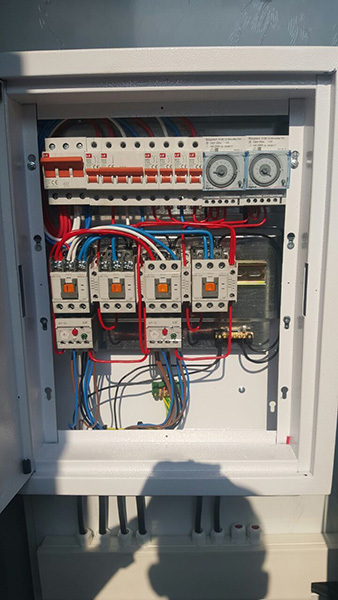 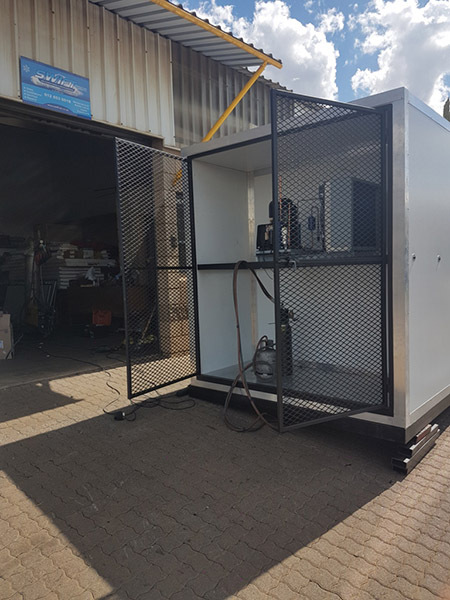 The rest of the container is build out of insulated panels, which is mounted to the steel base, wherafter the refrigeration system is installed inside the container, a 1.5m x 2m cavity is used for the condensing plant room. 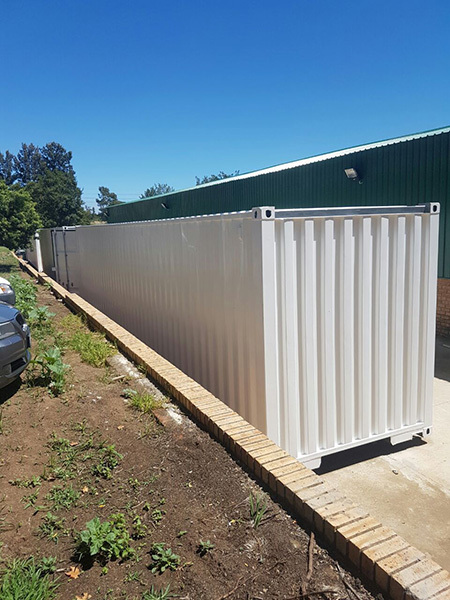 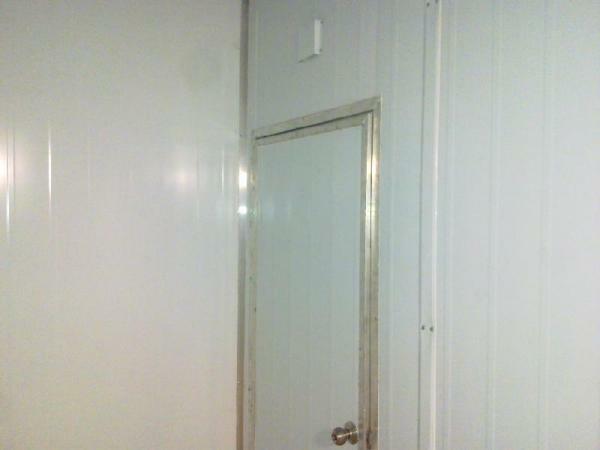 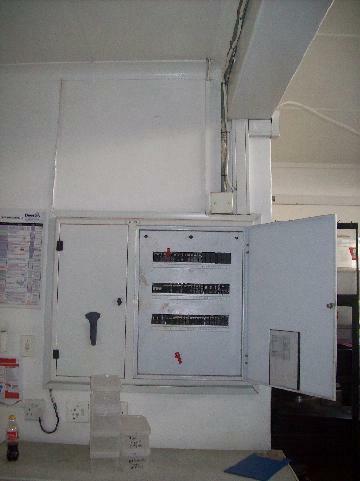 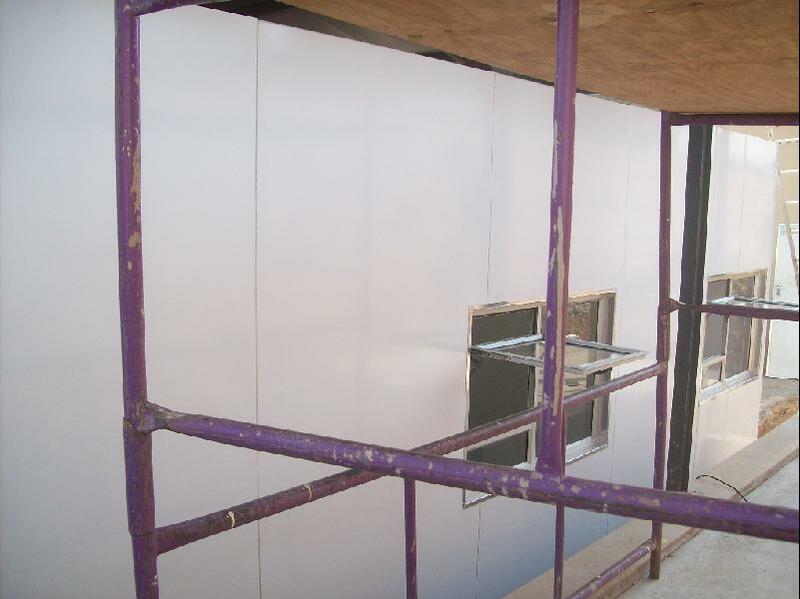 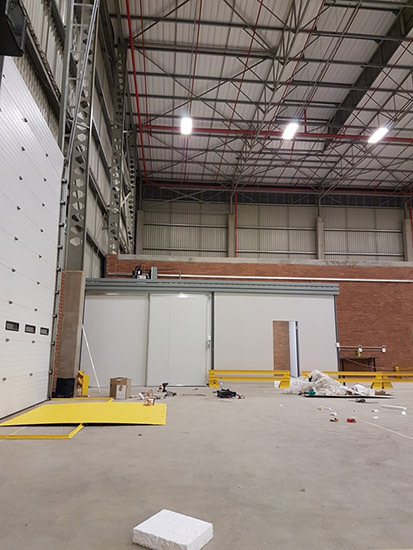 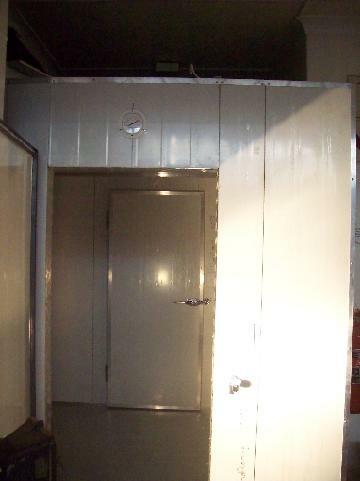 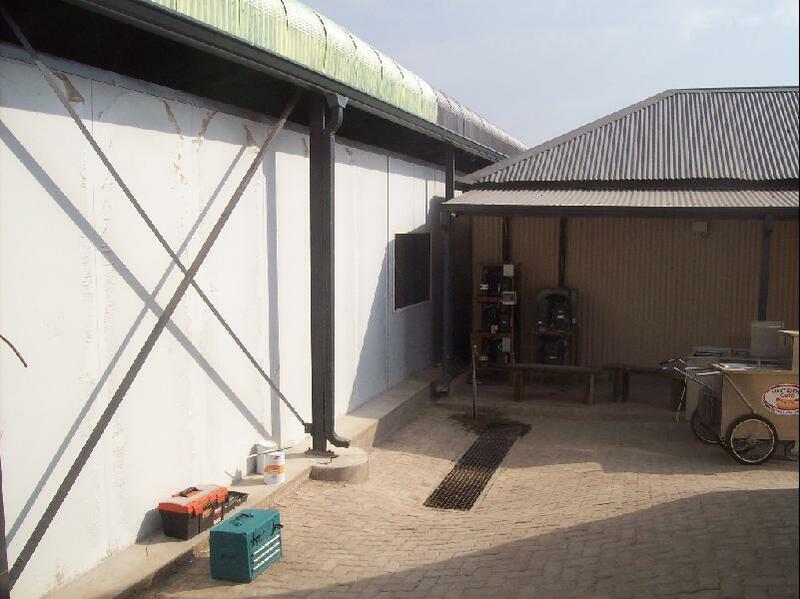 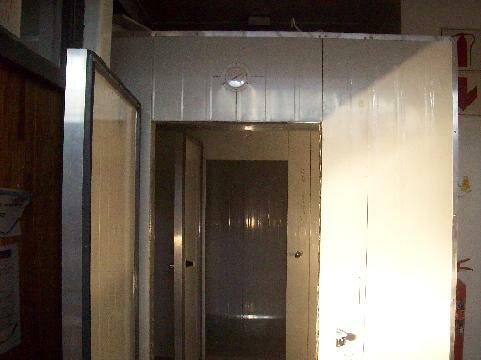 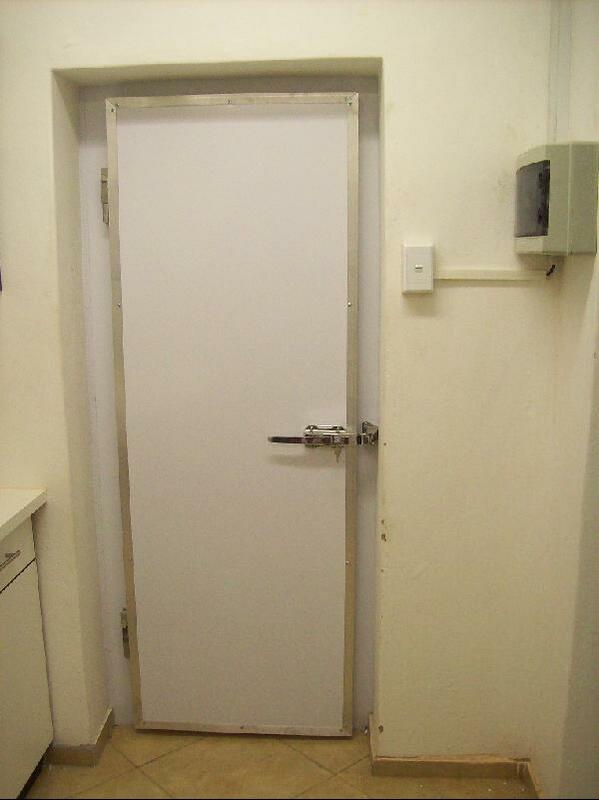 The unit is supplied with two locable insulated container doors, and a steel gate on the plant room is fitted. 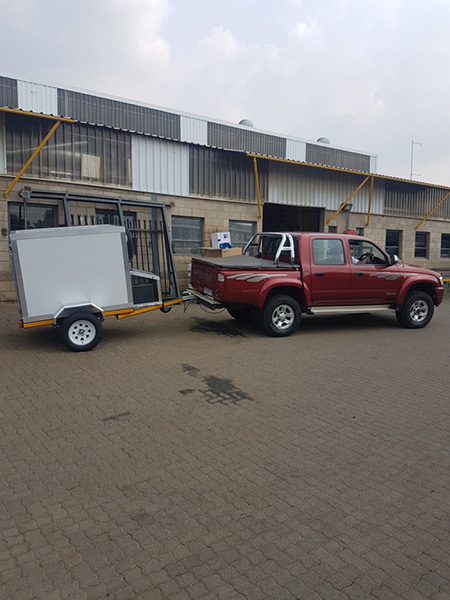 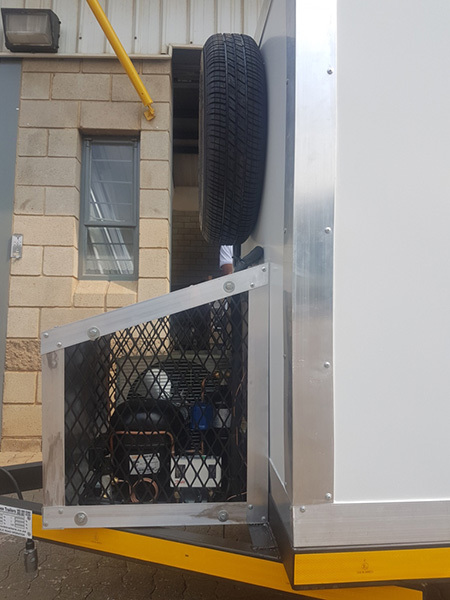 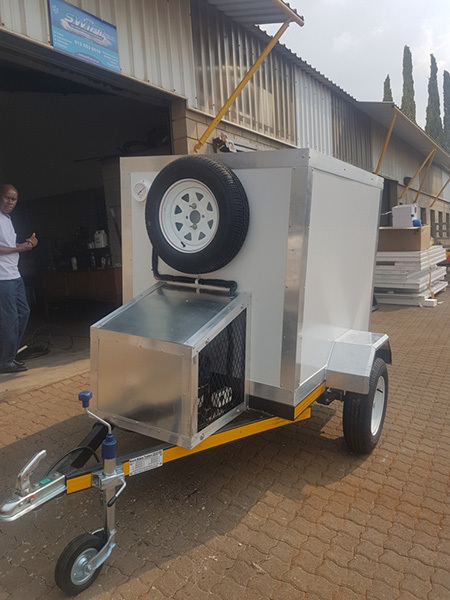 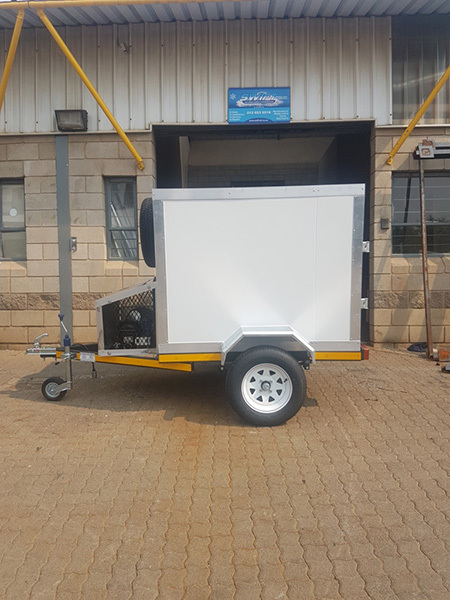 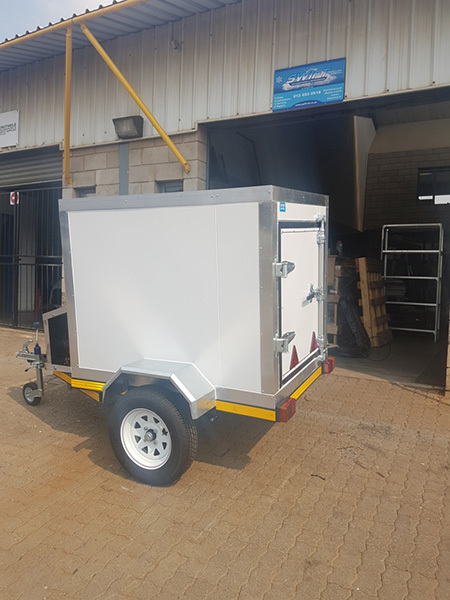 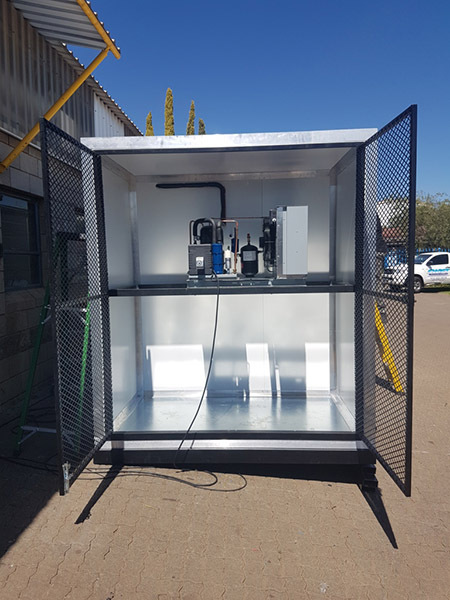 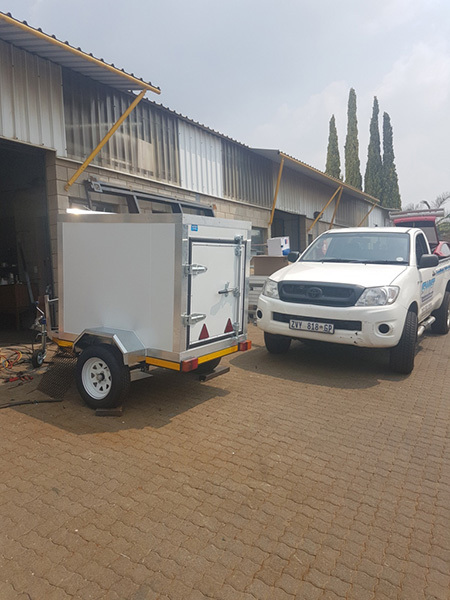 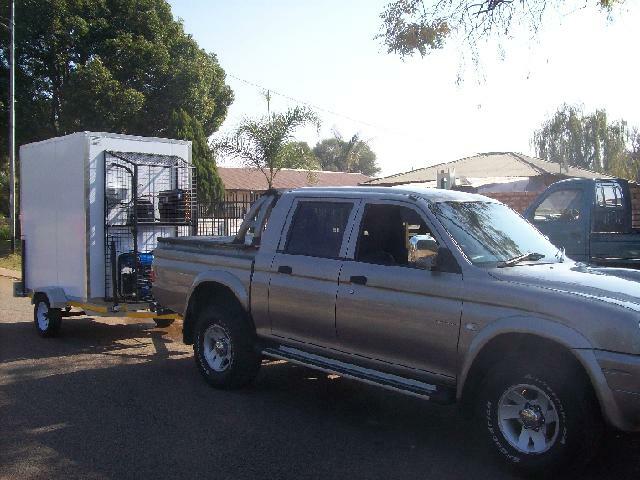 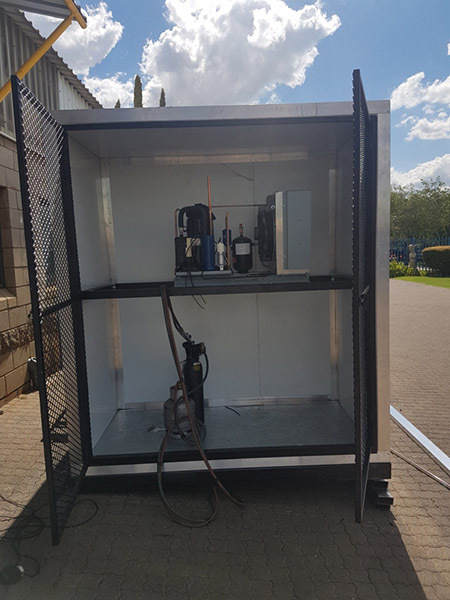 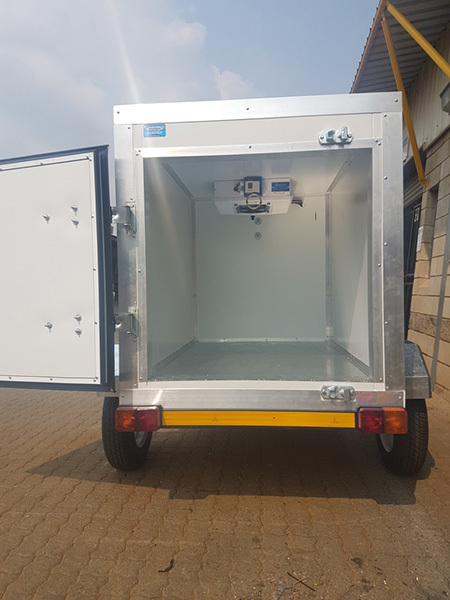 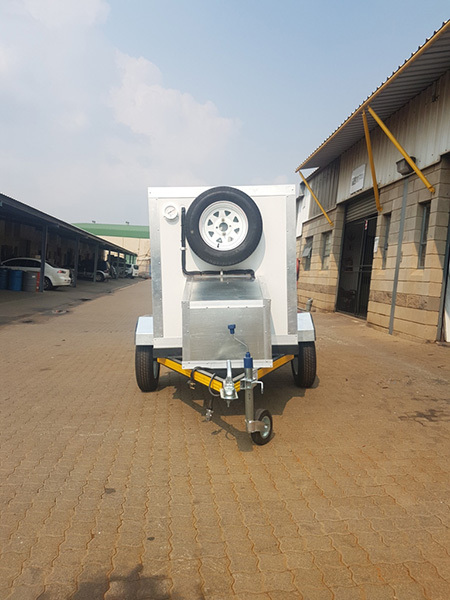 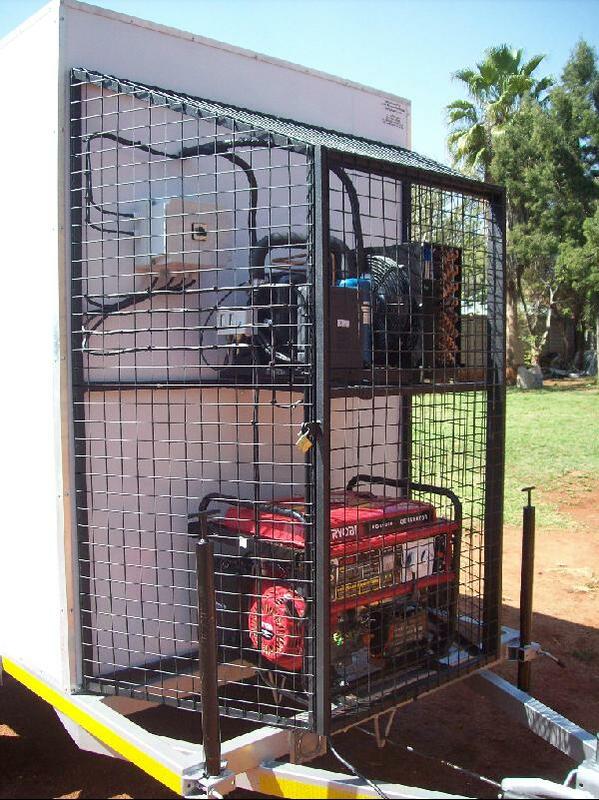 Especially designed for hunters, it is a small mobile cold room, perfect for the use of chilling drinks, and keeping carcasses fresh, it is a plug and play unit that can run from either a normal 220V wall plug or a generator. 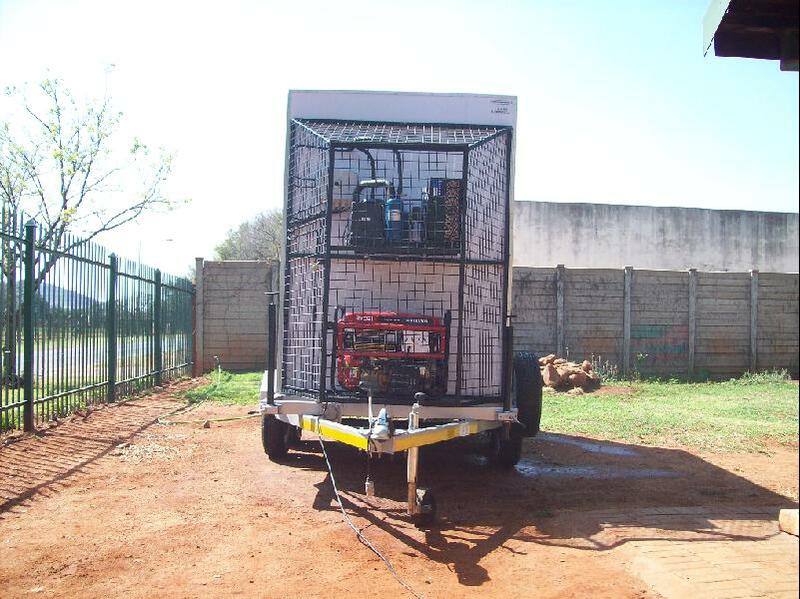 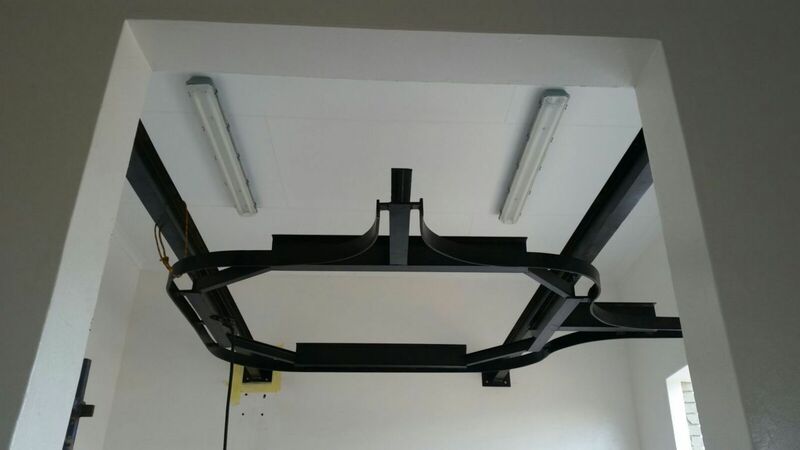 the standard loading capacity is 500Kg however, it can be adjusted on the axle size up to 750Kg. 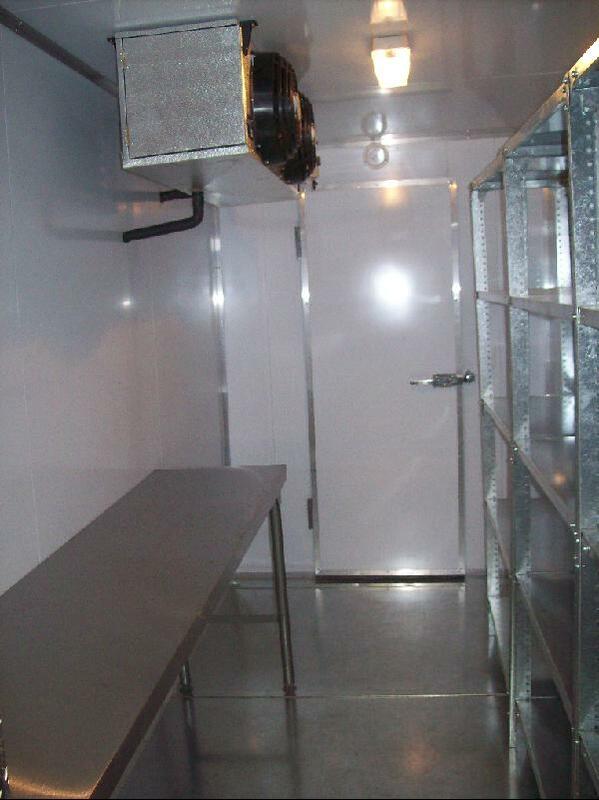 For the seasoned hunters, we have much larger mobile cold rooms available. 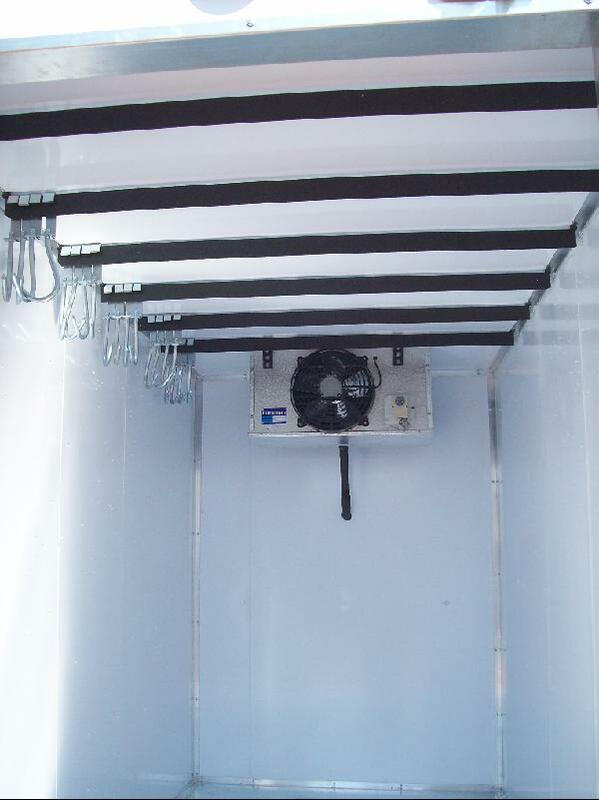 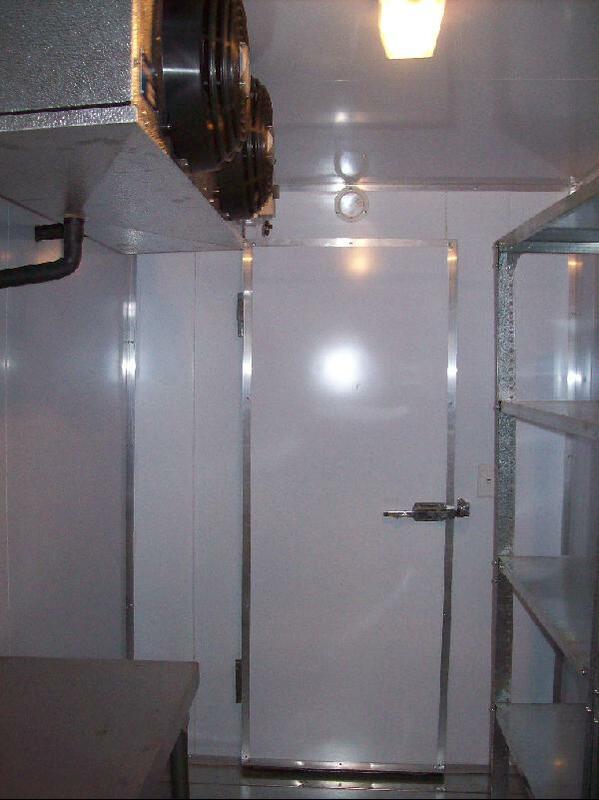 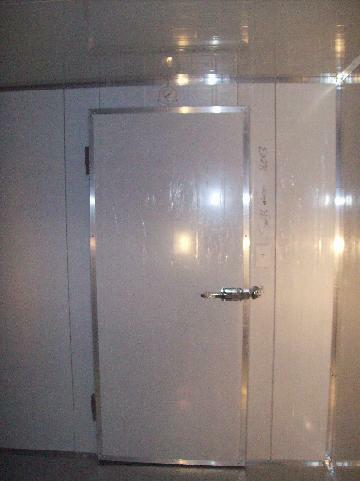 Please feel free to view the different options on our mobile cold rooms page. 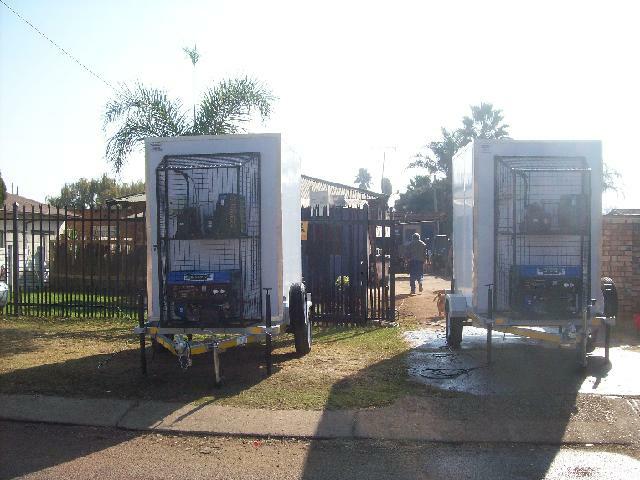 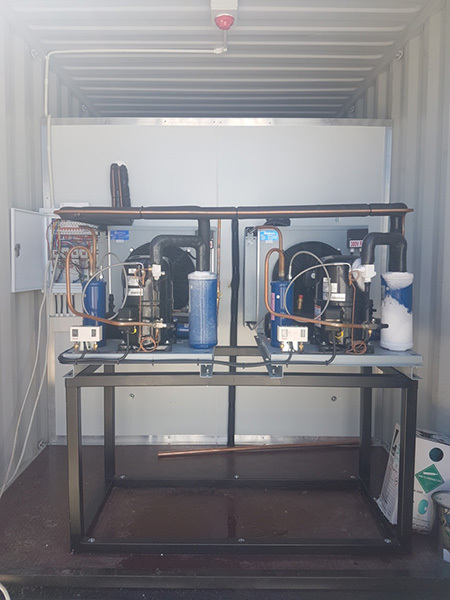 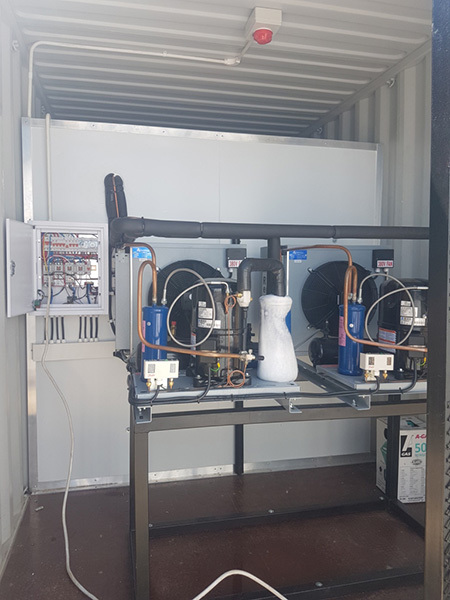 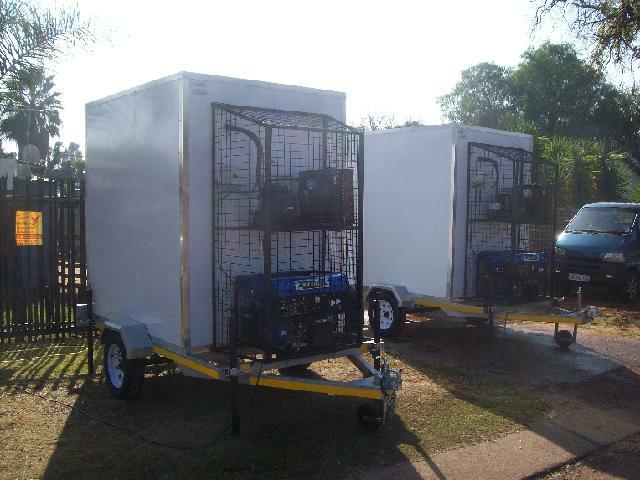 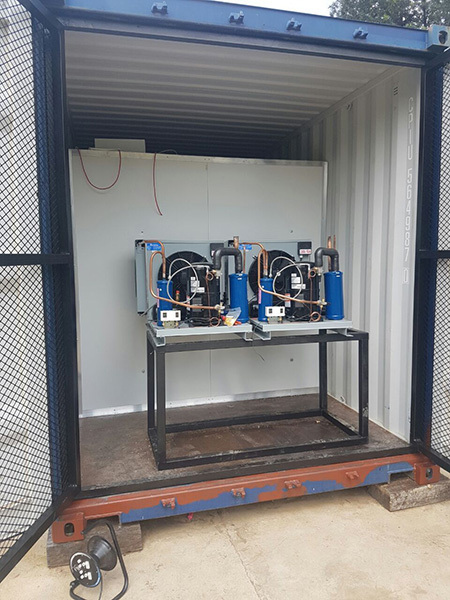 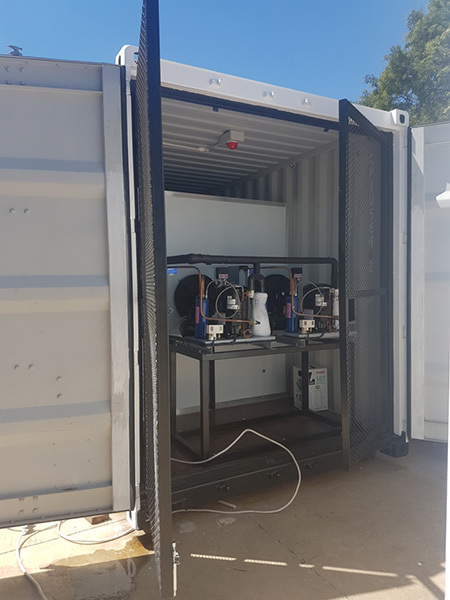 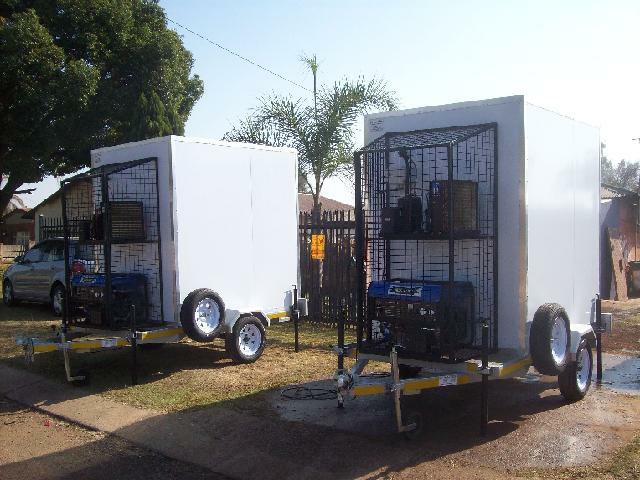 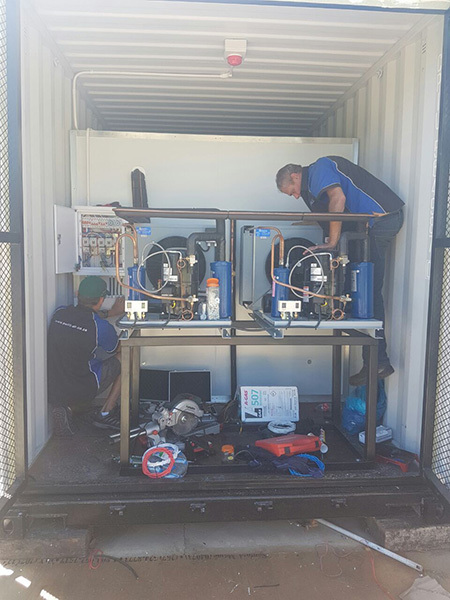 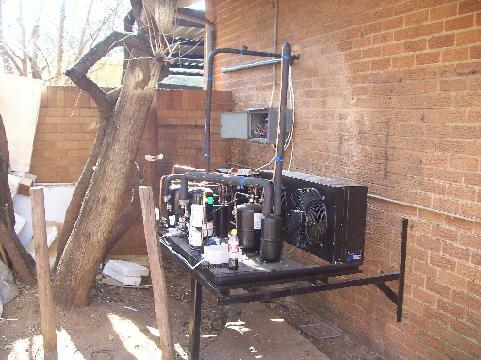 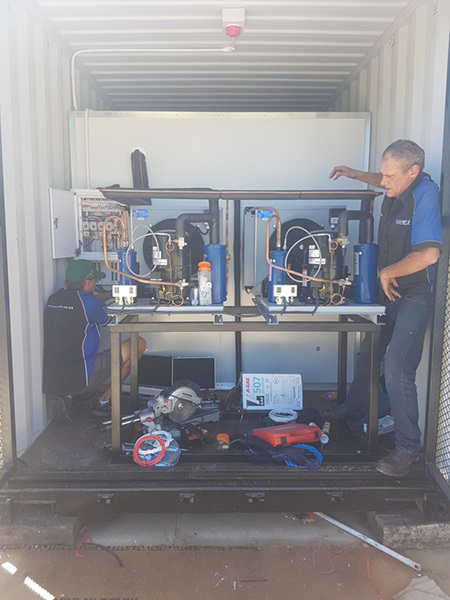 These container freezer laboratories has been manufactured for blood stations in Malawi Africa, they are all equiped with 2 blowers and 2 condenser each running on timers to switch over weekly, reason for this is to have a back up refrigeration system should one of the condensers fail to work, also it prolong's the life expectancy of each freezer container unit. 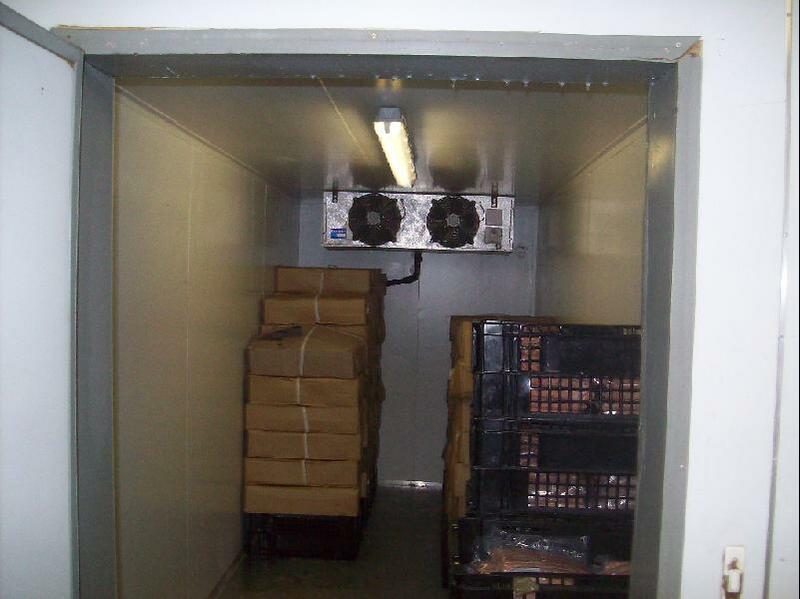 These freezers are running at a low temp of -20 degree Celsius.